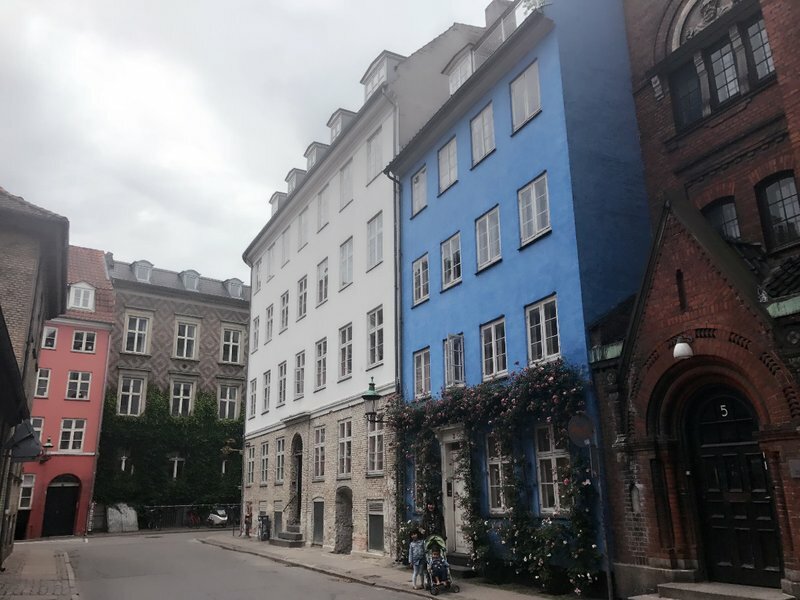 After I decided to expand our Copenhagen stop into a Scandinavian road trip, I kept the Copenhagen stay at six days. This ended up being a wise decision because there were plenty of things to do within a short drive of Copenhagen as well as in Copenhagen itself. Our first day trip was over the bridge to Malmö, Sweden where we were picking up our rental car. If you're going to visit Malmö, the first thing you should know is not to ignore the umlaut over the letter o. The umlaut means the name is pronounced something like Malmeuh, rather than Malmoh. Of course, you'll be understood if you pronounce the name of the city wrong but it's somewhat annoying to natives. Imagine someone calling the capital of your country Washingtown if you're American, or Londown if you're English. It's not that big of a deal, but always better to get it right if you can. 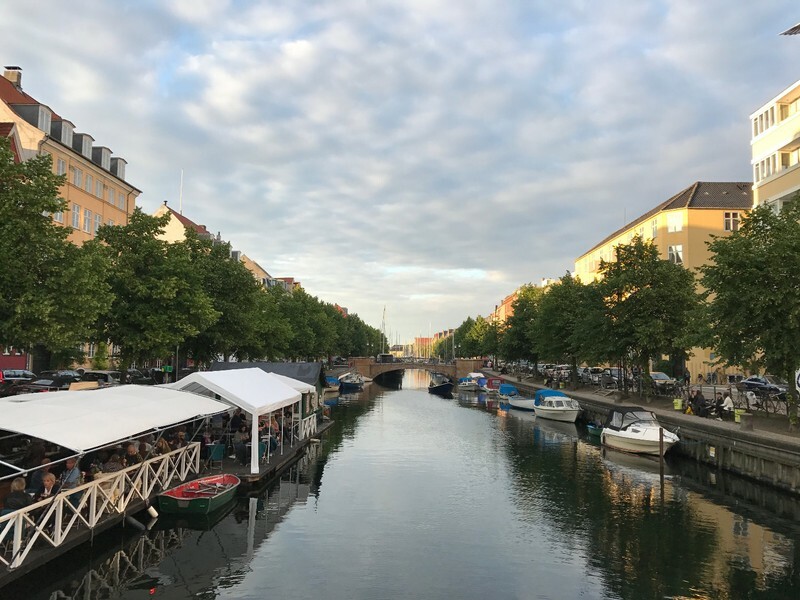 Like Copenhagen, Malmö is a city with a lot of water around in the form of sea, canals, and ponds. 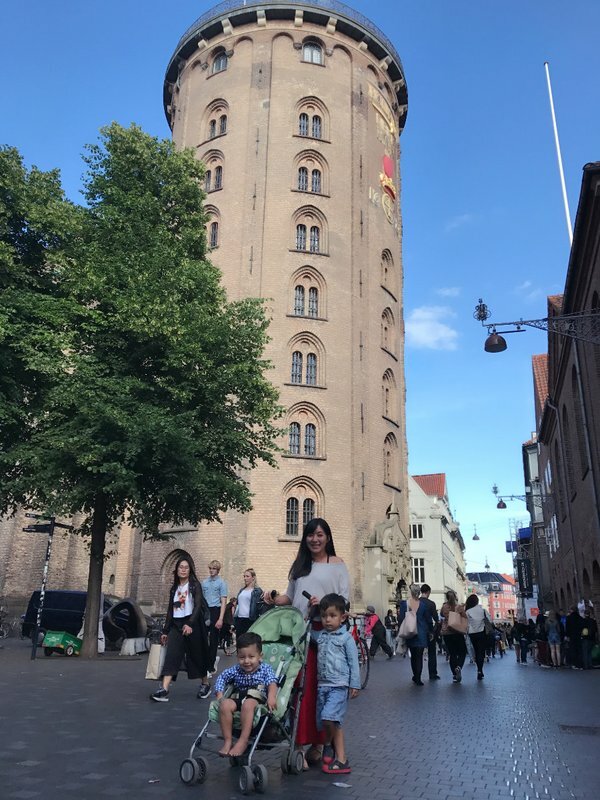 Walking southward alongside a wide canal towards the city center, we passed the stately and ornate post office before a colorful structure caught our eye on the other side of the canal. We crossed to find something that seemed to be part sculpture, part jungle gym. As far as the kids were concerned, it was 100% a jungle gym. 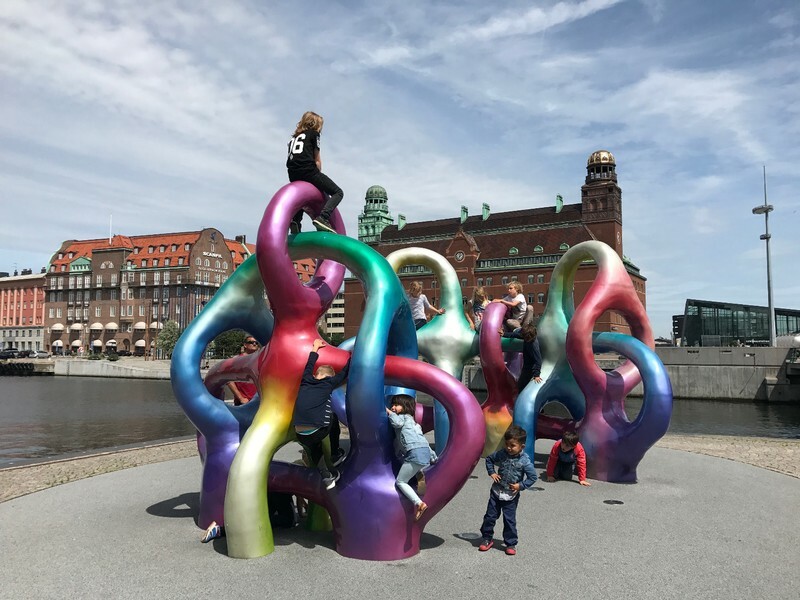 I later learned the sculpture is called Spectral Self Container, which was completed by the well-known Swedish sculptor Matti Kallioinen in 2013. 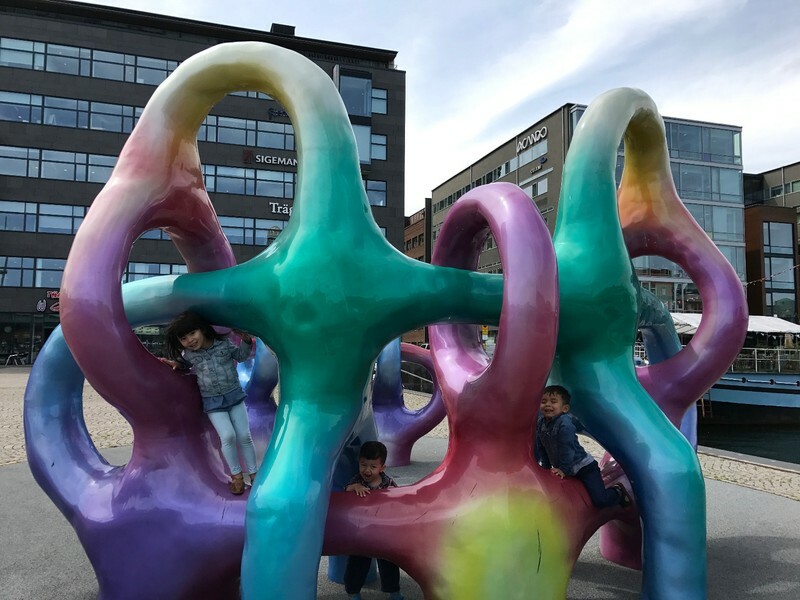 It turned out to be quite useful, because it occupied the kids while I spent a boring half hour in 7-11 trying to determine why my Denmark SIM didn't function at all in Malmö despite the assurances of the Danish 7-11 clerk in Copenhagen. Eventually I gave up and bought a new SIM card for Sweden. 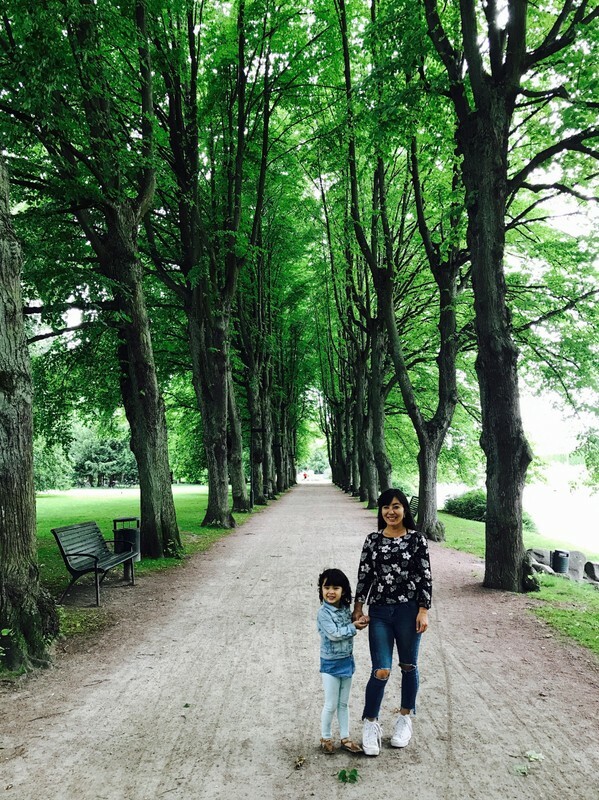 We didn't have to walk much further to reach Malmö's picturesque center. 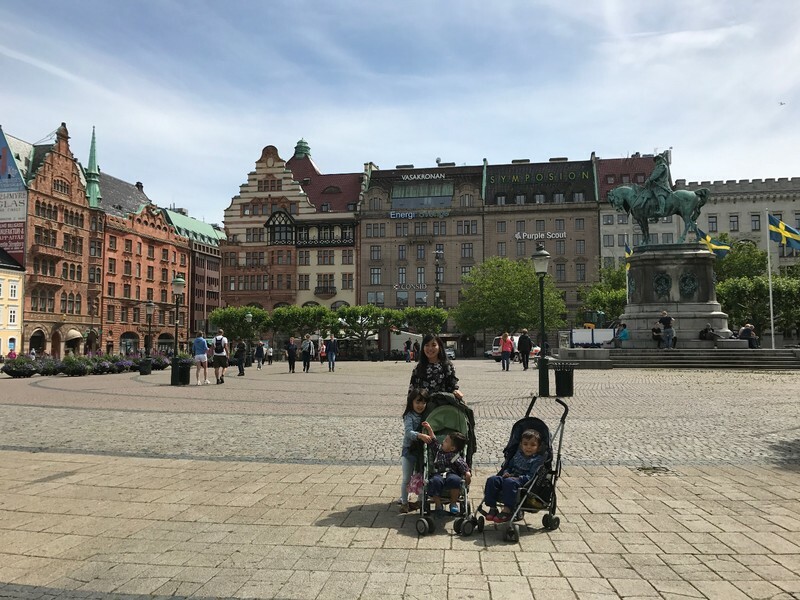 There are two central squares called Lilla Torg, the little square, and Stortorget, the great square. 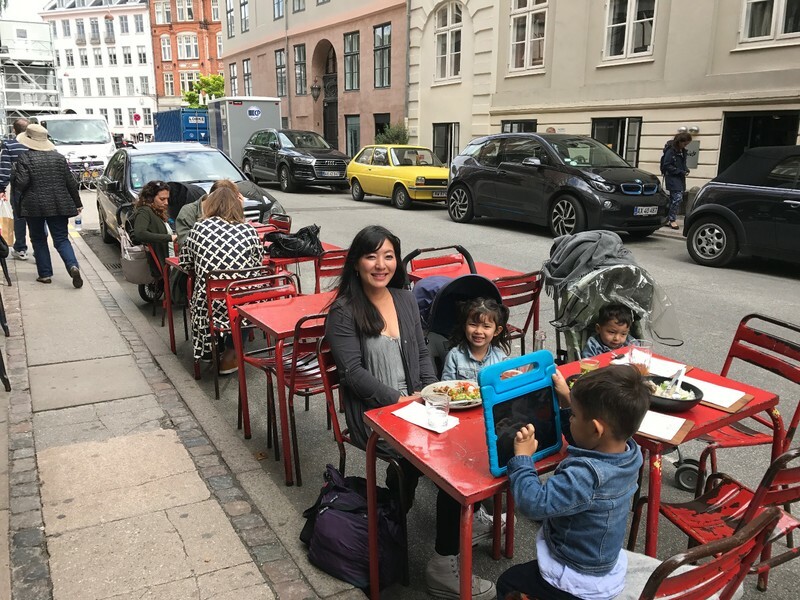 We had lunch at a cafe called Moosehead in Lilla Torg whose menu offered an incongruous but satisfying mixture of Thai food and burgers. Stortorget was surrounded by tall, beautiful townhouses and had a monument to King Charles X Gustav on horseback in the center. 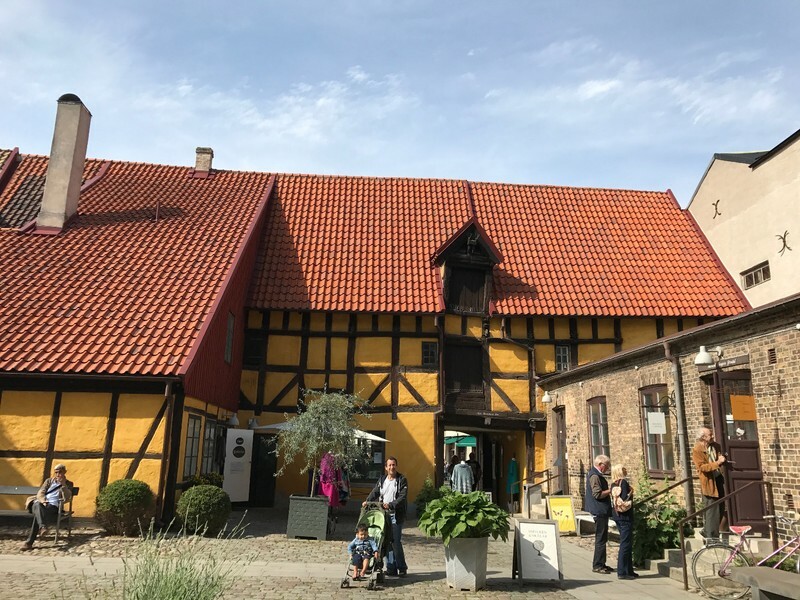 The surrounding area was largely pedestrianised and filled with traditional Swedish homes which were now shops and galleries. 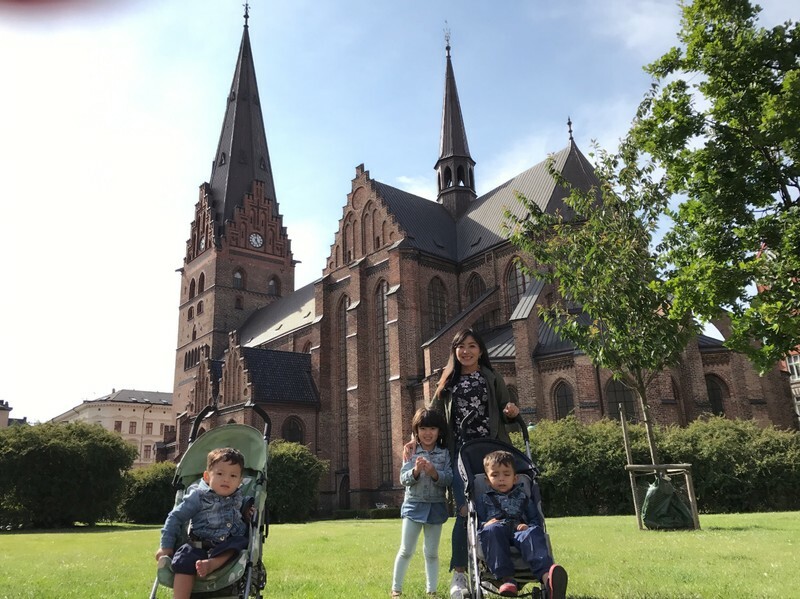 Not far from Stortorget was Sankt Petri Kyrka, the most famous church in Malmö. The 14th century Gothic exterior is built almost entirely from brick, yet the facades and buttresses had a complex and sculpted appearance that was very appealing. A few blocks south we ran into the moat-like canal that surrounds central Malmö. 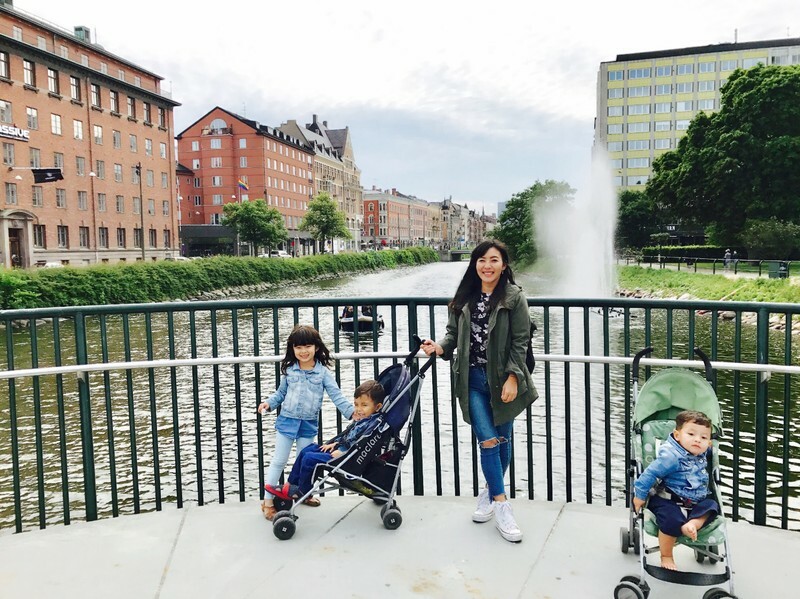 We checked out the view of the canal from one of the bridges then walked along the canalside promenade to Malmö's premiere green space Slottsparken. We spent another hour circling back towards the car in Slottsparken, passing an interesting windmill and the relatively nondescript Malmö Castle, which is now a museum. After that, it was time to retrieve our new car and head back to Copenhagen for a well-earned dinner. Until I visited Denmark, I'd never realized how close the country was to being an archipelago. The largest part of the country is connected to the European mainland, but only by an isthmus so long and narrow that it might as well be an island. Aside from the peninsula there are several large islands including Zealand, the one on which Copenhagen is situated. 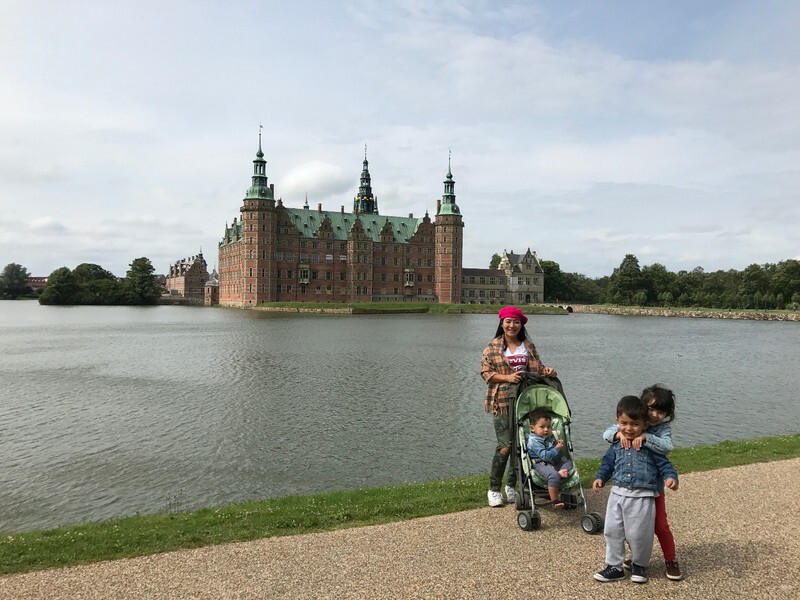 Our destination for our first full day in Denmark with a car was the northeastern part of Zealand, home to legendary castles and beautiful scenery. 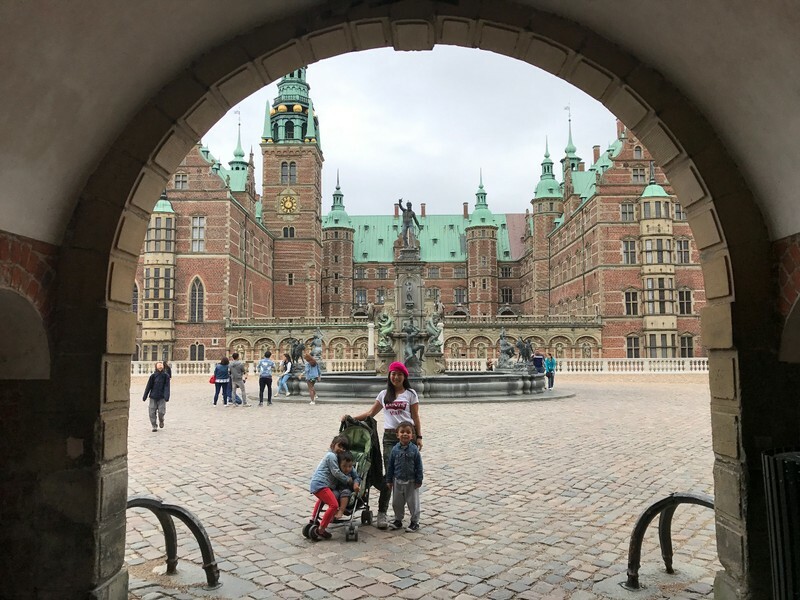 After breakfast we drove straight to Frederiksborg Castle, near the town of Hillerød. The design of the castle was breathtaking, an enormous yet intricate edifice of red brick with countless turrets and spires. The castle was set in the middle of a large pond with swans and other birds, and to the rear were expansive and lush gardens. The interior of the castle was equally impressive, especially the imposing and ornate Great Hall which is also an 18th century restoration after the original was destroyed by fire. On the way out I got a nice shot of the famous Neptune fountain framed by the archway of one of the outlying buildings. The current fountain is actually a 19th century copy of the 17th original which was taken by the Swedes as war booty a few decades after its construction. Are the Danes still pissed off about it? I never had a chance to ask, although I've heard there's not a lot of love lost between the people of the two countries. For lunch we drove up to Hornbaek on the northern coast of Zealand, where there's a fish restaurant with a small seafood market right next to the harbor. All the kids were sleeping and it was too windy to eat outside, so we ate our lunches on trays in the car. 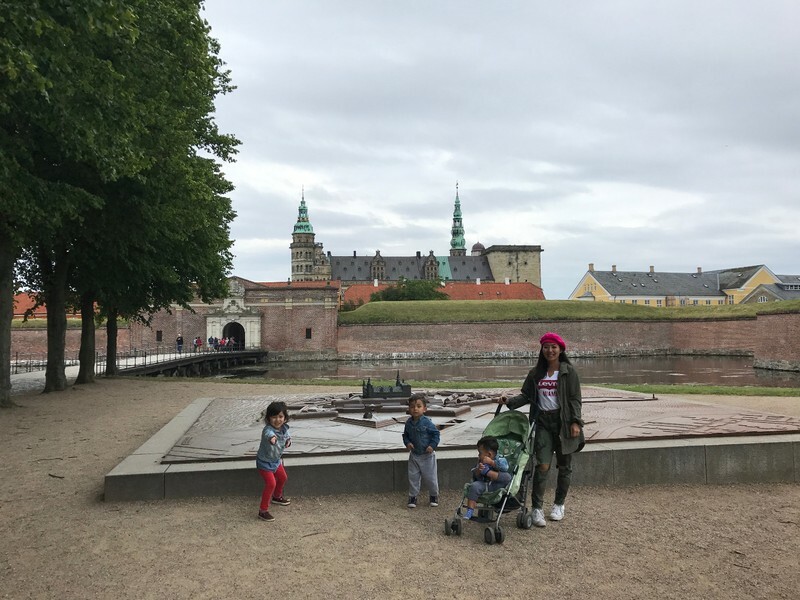 Ten minutes from Hornbaek was Kronborg Castle, famous for being the inspiration for Hamlet's castle Elsinore. The castle is located on a promontory at the narrowest point of the Øresund, just two miles from the Swedish coastline. 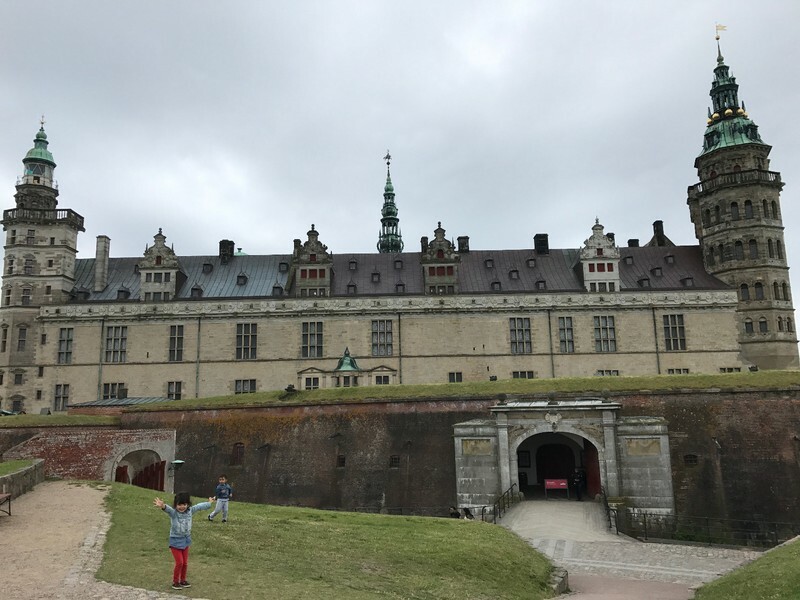 Kronborg has a somewhat bleaker appearance than Frederiksborg, probably due to serving double duty as a fortress controlling entrance into the Øresund as well as being a royal residence. We decided to forgo the steep entry price and limited our exploration to the grounds and gift shop. 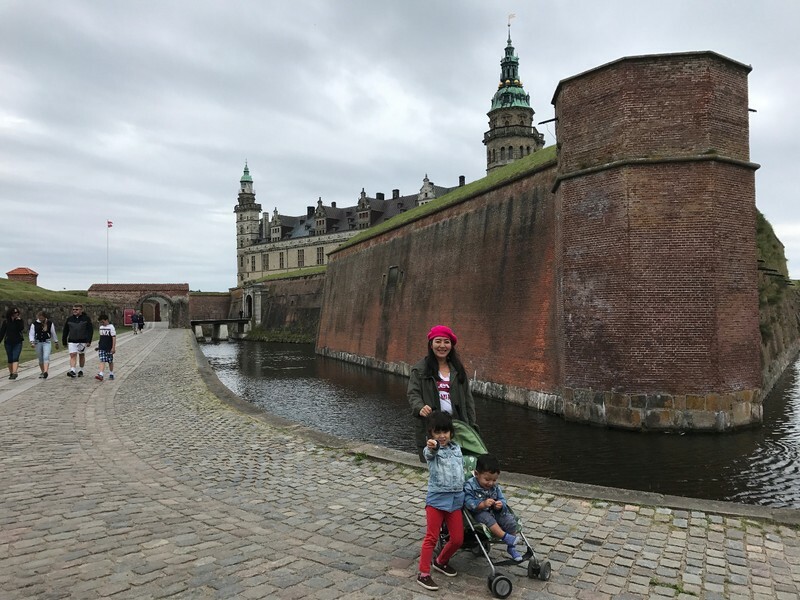 Kronborg Castle is next to the midsized town of Helsingør, which has a well-preserved town center with centuries-old townhouses and cobblestone streets. The town was surprisingly busy and touristy, considering there hadn't been much of a crowd at the castle. We were excited to find a large epicurean market in the main square, although I'm not sure if it was a seasonal event or a one-off. 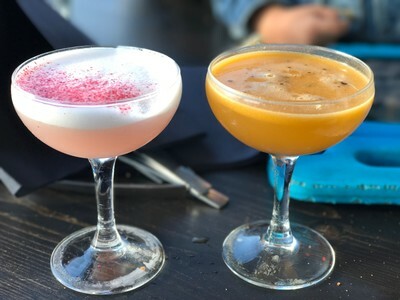 We enjoyed the market and had drinks in a cozy cafe before returning to Copenhagen for dinner. 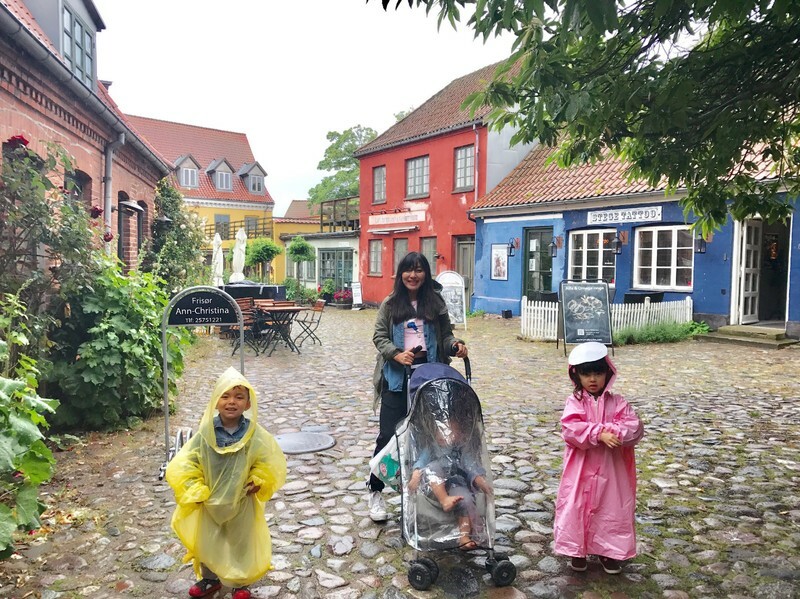 The next day was the coldest and rainiest of the entire Scandinavian road trip. We started out at the Viking Ship Museum in Roskilde, a town better known for its annual electronic music festival. Perhaps it was the drizzle and overcast skies, but the town seemed very dreary and plain. The museum wasn't very exciting either, with a few boat skeletons and other drab displays. It was too cold to participate in the craft workshops outside, which weren't included in the already hefty admission prices. The kids attempted a little hammer throwing and then we were back on the road to the little island of Møn just south of Zealand. It was a long drive to Møn so by the time we reached the little town of Stege we were more than ready for lunch. Fortunately there was an excellent cafe called David's which had delicious salads and sandwiches. Our ultimate destination was GeoCenter Møns Klint, a geological museum at the eastern tip of the island. 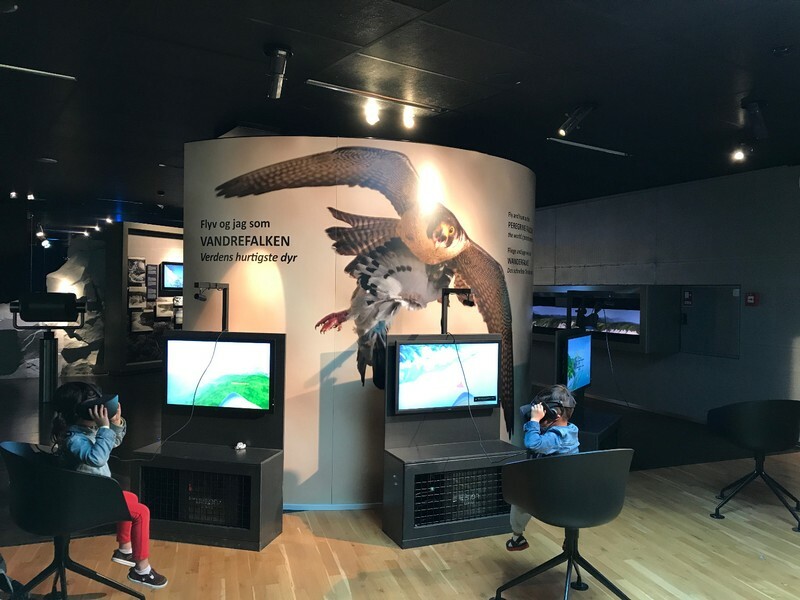 The largely underground museum is perched at the top of Møn's famous chalk cliffs. The last part of the drive took us through a very spooky and misty forest. The GeoCenter was as delightful as the Viking Museum had been disappointing. 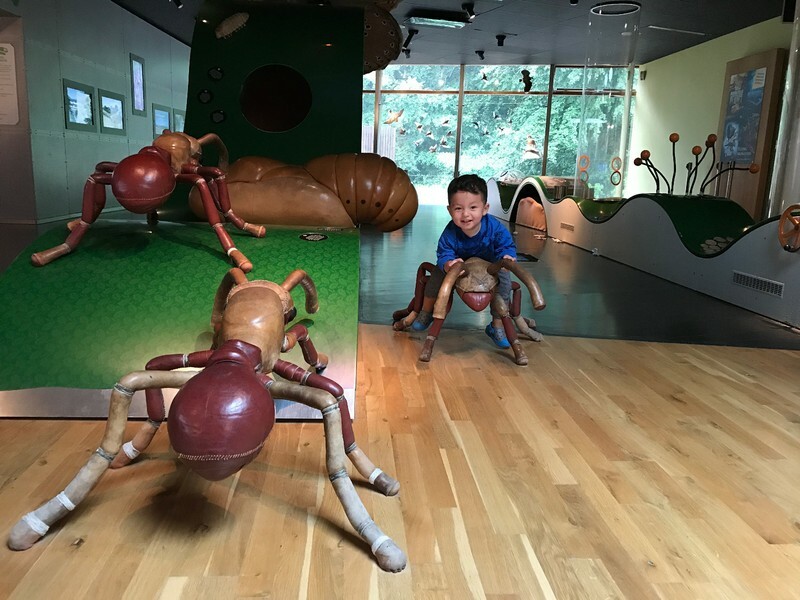 It was much more than a geological museum, with plenty of interactive exhibits covering everything from erosion to dinosaurs. After a couple of pleasant hours in the GeoCenter, we explored the boardwalk behind the museum that ran along the edge of the cliffs. 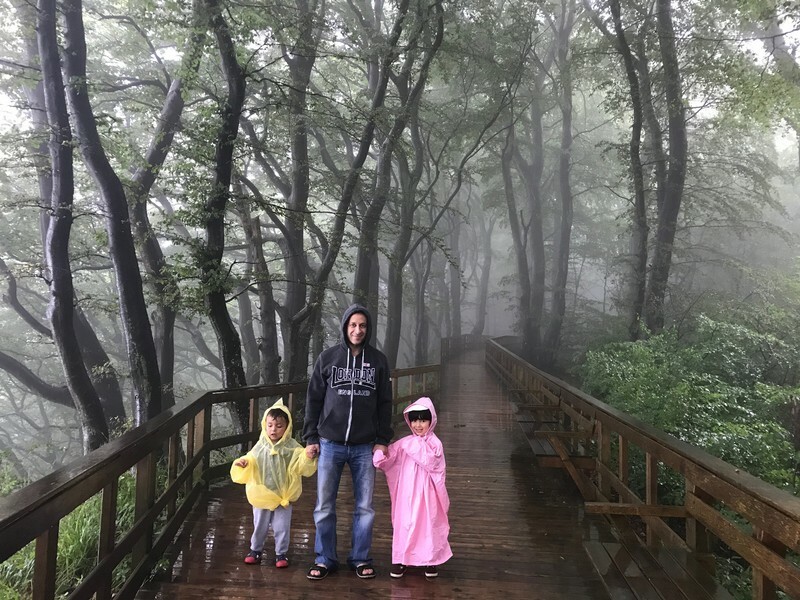 Unfortunately the mist obscured the limited view of the cliffs available from the boardwalk and descending the hundreds of stairs to the beach below was out of the question. Instead we packed everyone up and began the long drive back to Copenhagen for dinner. 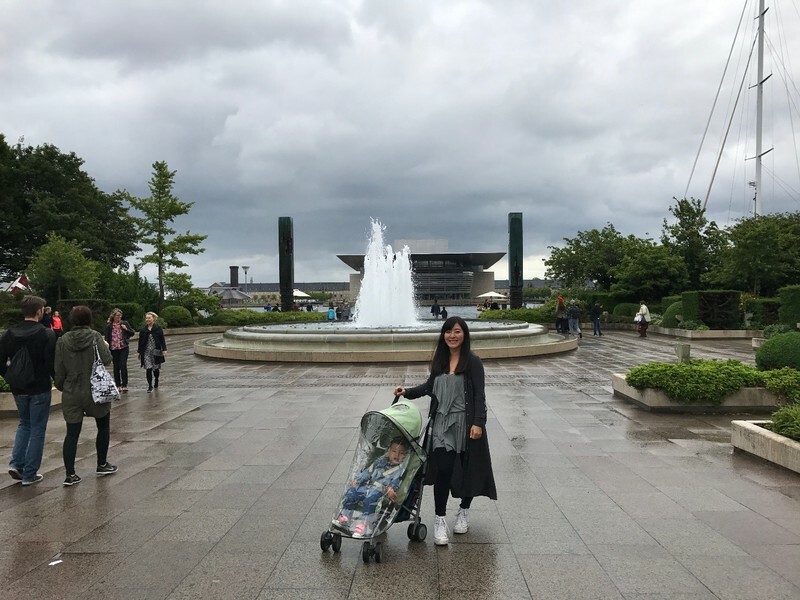 Thanks to day trips and some rain, we didn't do our Copenhagen walkaround until our last full day. We had the additional advantage of Sunday being a free day for parking. Leaving the car for the entire day in the central Red Zone where our Airbnb was located would have cost us an arm and a leg any other day. 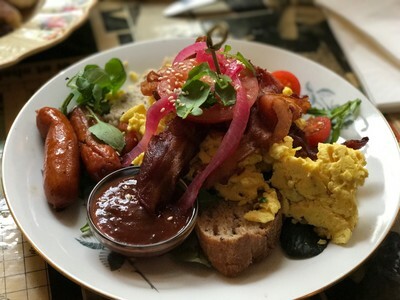 We had another awesome breakfast near the Airbnb and walked a block to the botanical garden which had a large greenhouse and delightful paths to walk on. 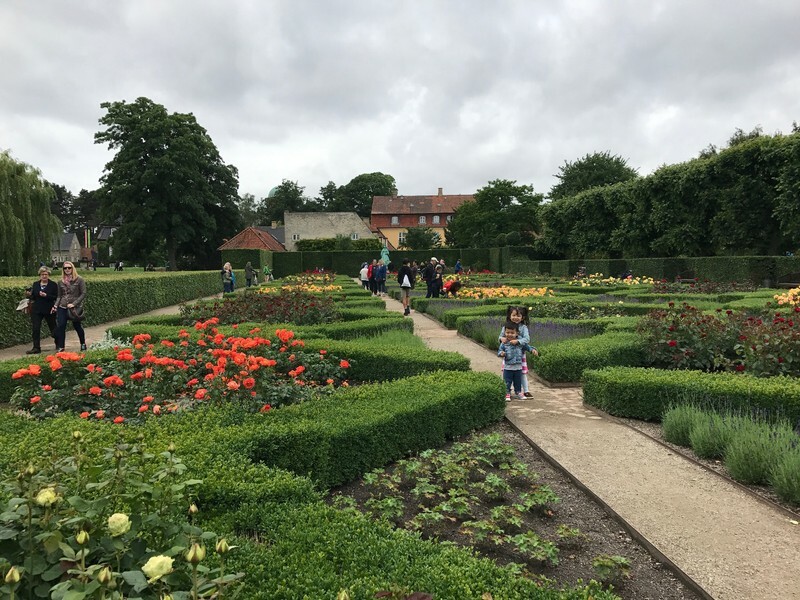 Just southeast of the botanical garden are the 17th century castle Rosenborg Slot and Kongens Have, the King's Gardens. 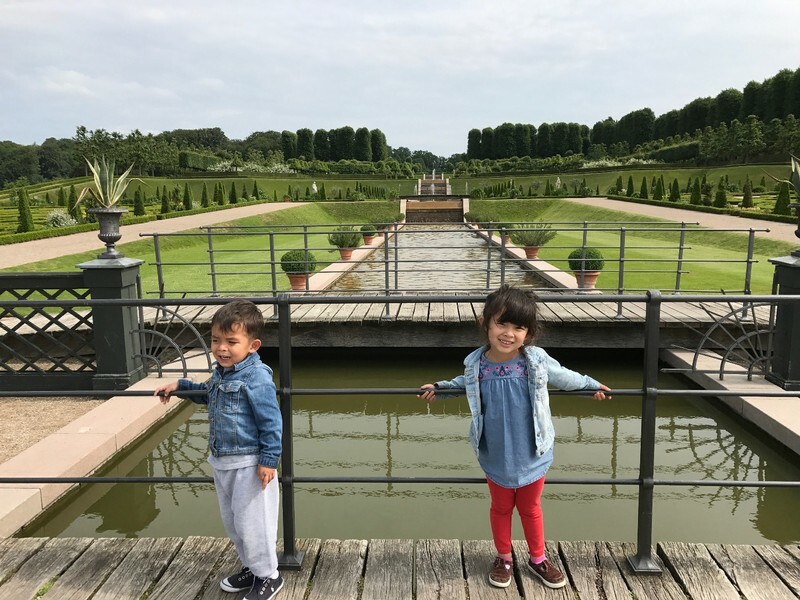 Having just visited the enormous Frederiksborg Slot a few days earlier, we decided to pass up the interior of the castle in favor of a longer walk through the lush, manicured gardens. 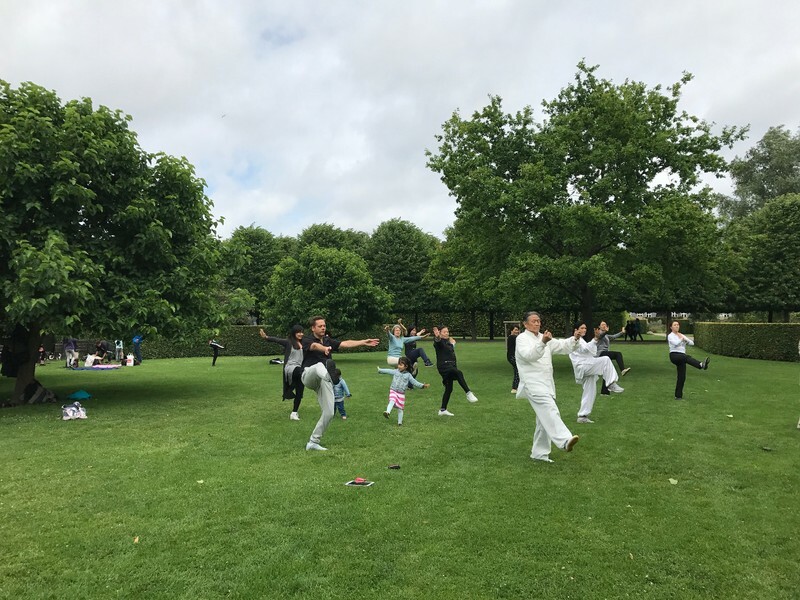 Mei Ling, Cleo and Spenser used the extra time to participate in a tai chi class on one of the lawns. The Danes were disappointed to learn we wouldn't be able to come back the next Sunday. 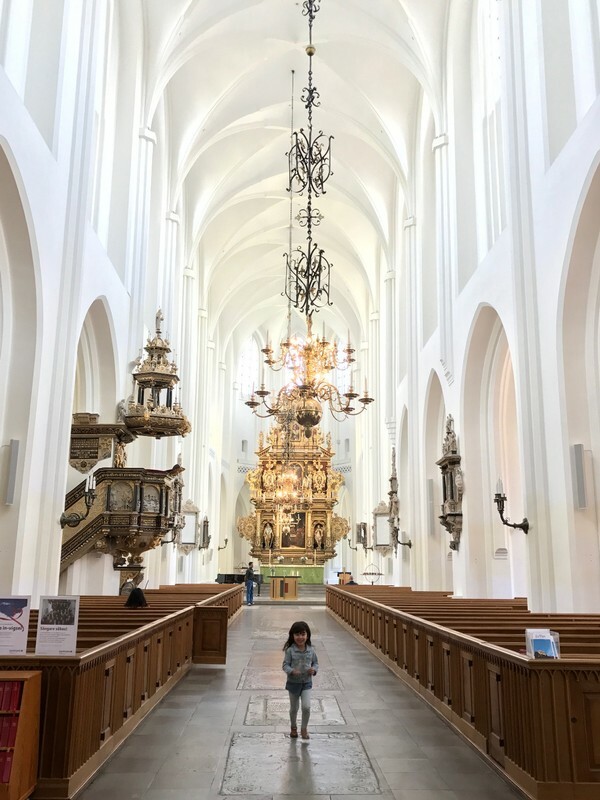 A couple of blocks southeast of Kongens Have we found Frederiks Kirke, also known as the Marble Church, a beautiful 18th century rococo church with a distinctive green dome that is the largest in Scandinavia. 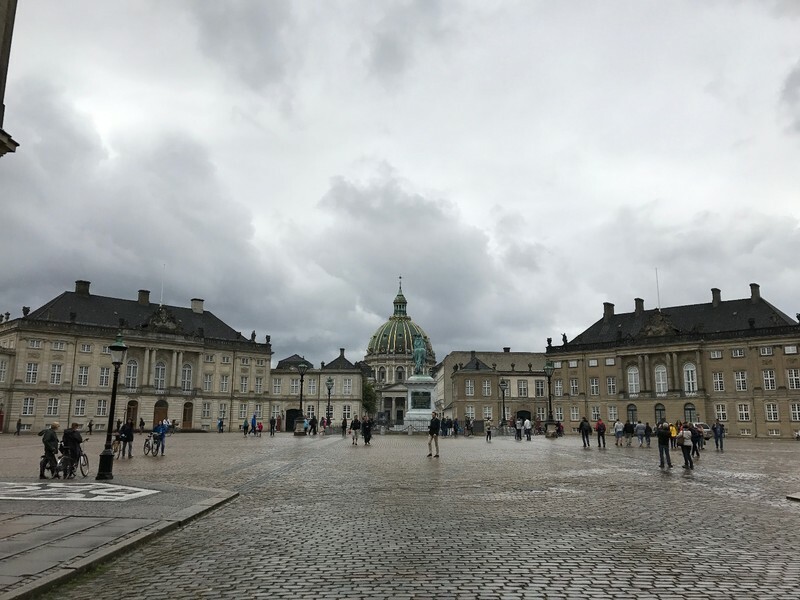 We followed a small street to the octagonal courtyard of Amalienborg Palace, the home of the Danish royal family. 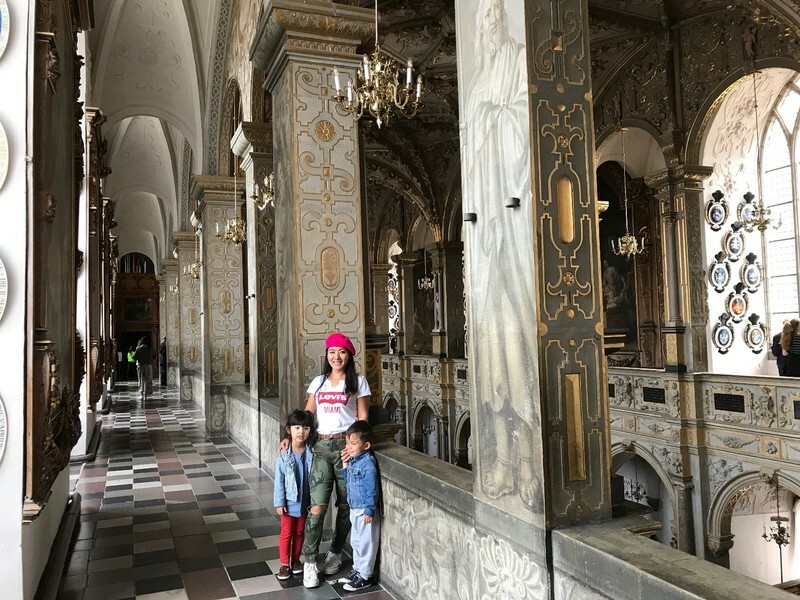 We probably could have spent an entire day visiting and exploring all the churches and palaces, but in general we prefer to stick to the streets and markets. 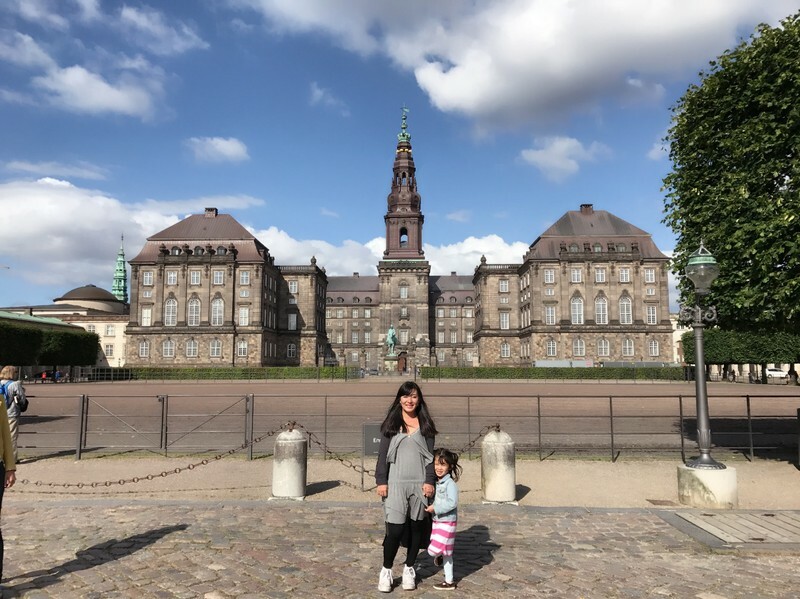 Continuing southeast from Amalienborg we quickly found ourselves at the shoreline of Copenhagen Harbor. There was a small park here called Amaliehaven with a central fountain. Across the harbor we could see the Copenhagen Opera House. Not far from the Opera House I could see a large number of people milling around on a patio. 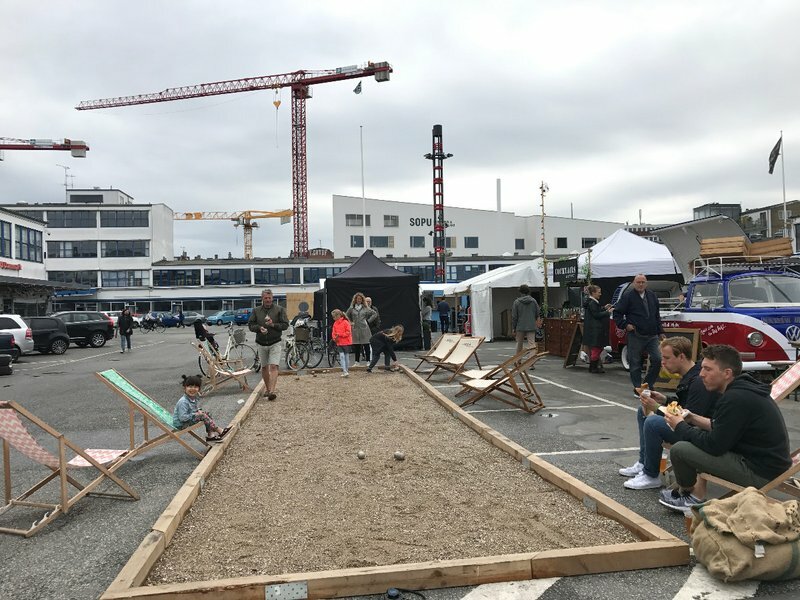 I thought at first it might be an outdoor concert then realized with a shock that I was looking at Copenhagen Street Food from a whole different perspective. It had taken so long to drive there I assumed it was very far from where we were staying, but actually it was just a half hour's walk away. 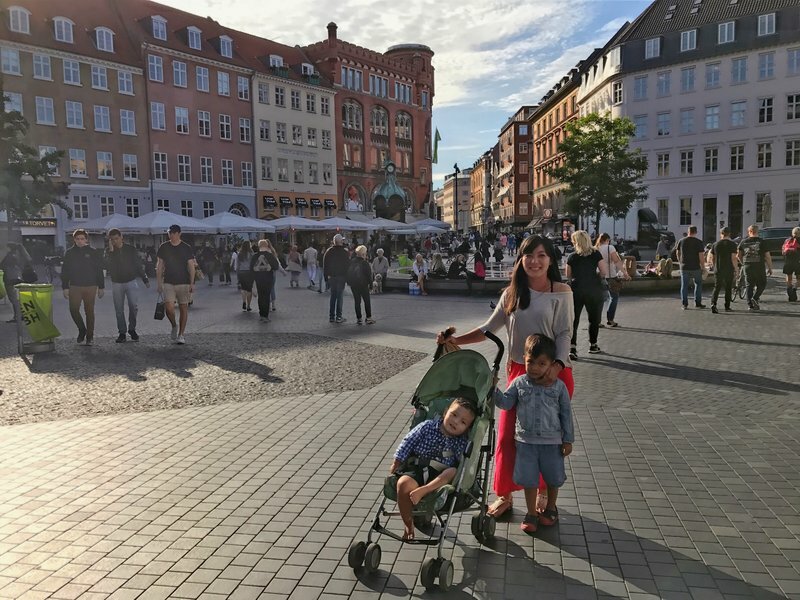 Just a block south of Amaliehaven was Nyhavn, the center of tourist activity in Copenhagen. 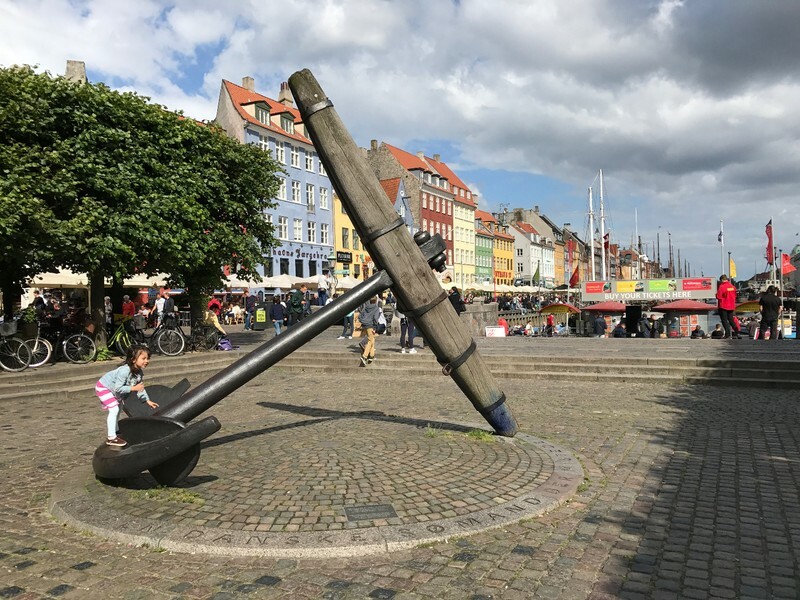 The short dead end canal off Copenhagen Harbor was built in the 17th century to facilitate unloading of fish and cargo at Kongens Nytorv, which is now a public square. 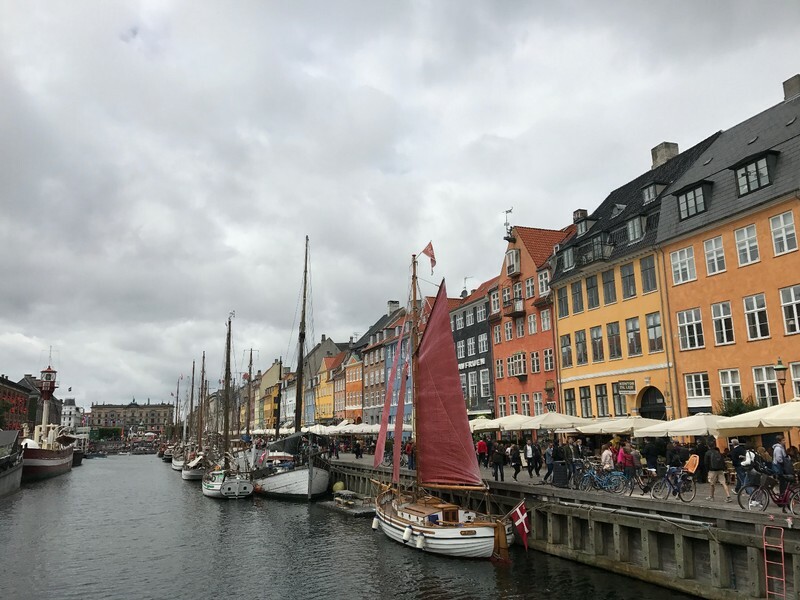 Nyhavn is now mainly used as a port for tour boats, and is lined with chain restaurants and souvenir shops. 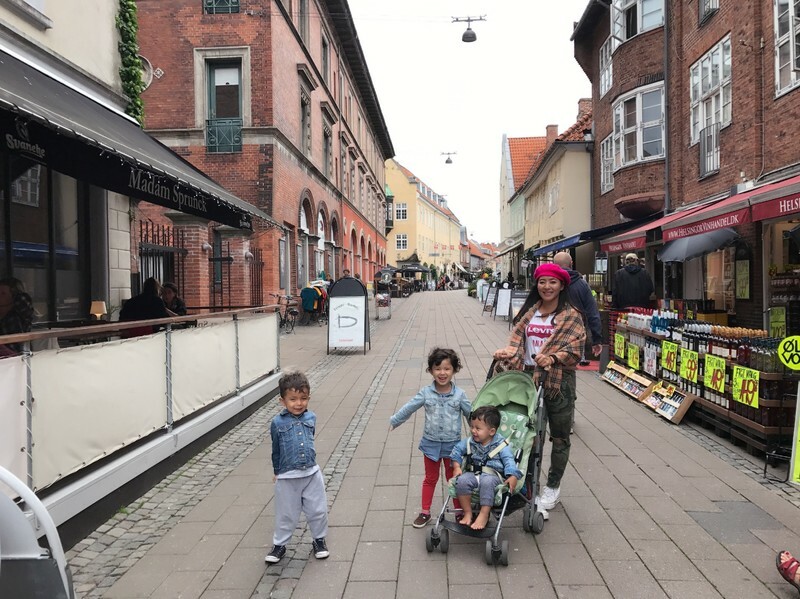 The most distinctive feature of Nyhavn is the collection of brightly covered townhouses, some of which date back to the 17th century as well. Because of the high concentration of tourists, it wasn't easy to find a place worth eating at. The canalside restaurants seemed to have the usual selections of bland international food. We employed TripAdvisor and were able to find a decent meal a couple of blocks away, even though our table was in an active roadway. 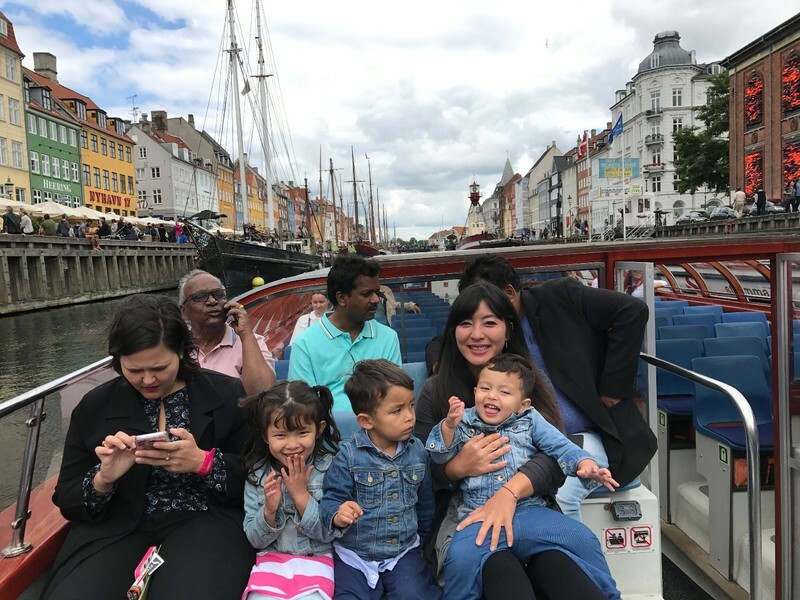 The kids were clamoring for a boat ride and the prices weren't unreasonable for a one hour tour, so we decided one touristy activity wouldn't kill our vibe too badly. In fact, the tour turned out to be quite worthwhile. As in Venice, seeing the city from the perspective of the water feels completely different from being on land. 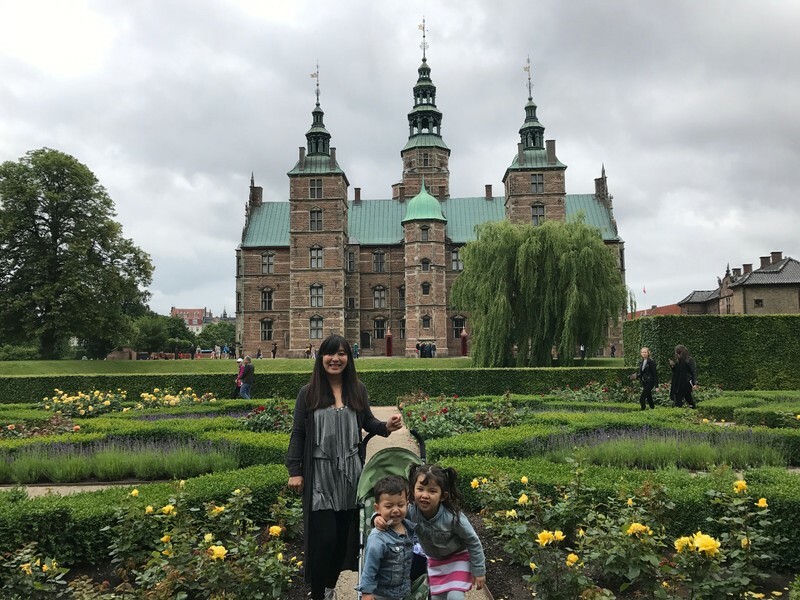 The boat took us around the narrow semicircular canal that forms the island of Slotsholmen, which is the site of the Danish Parliament. 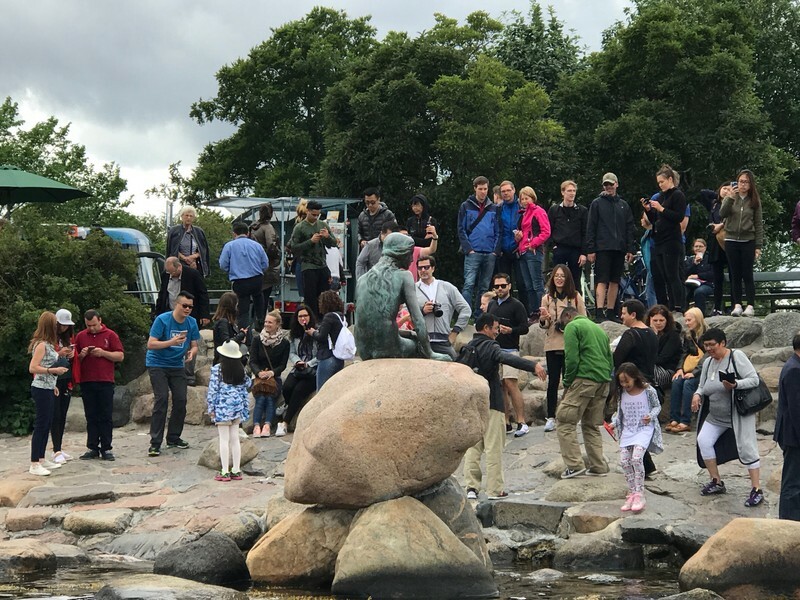 We also went to the north end of the harbor to see the Little Mermaid statue, which we never would have bothered with on our own. The most impressive thing wasn't the statue itself but the flock of tourists that were gathered around the unassuming little sculpture. It always amazes me how many travelers dedicate themselves to checking off every attraction listed in their guidebook at the expense of missing all kinds of amazing sights and experiences in the city streets. 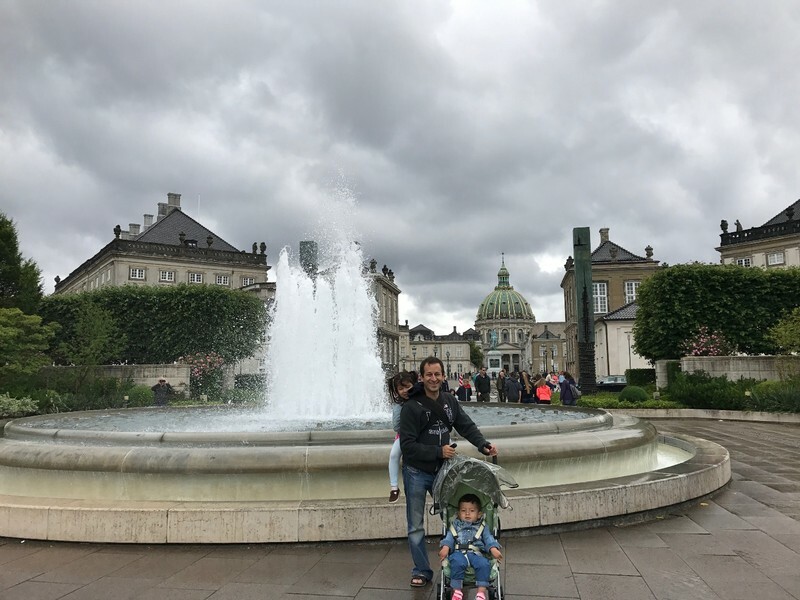 From Nyhavn we walked southwest to Tivoli Gardens, crossing the bridges into and out of Slotsholmen and passing Parliament and many other stately paragons of classic architecture. The area was largely deserted on a Sunday afternoon, and the imposing buildings and cloudy skies gave the area a forsaken atmosphere. 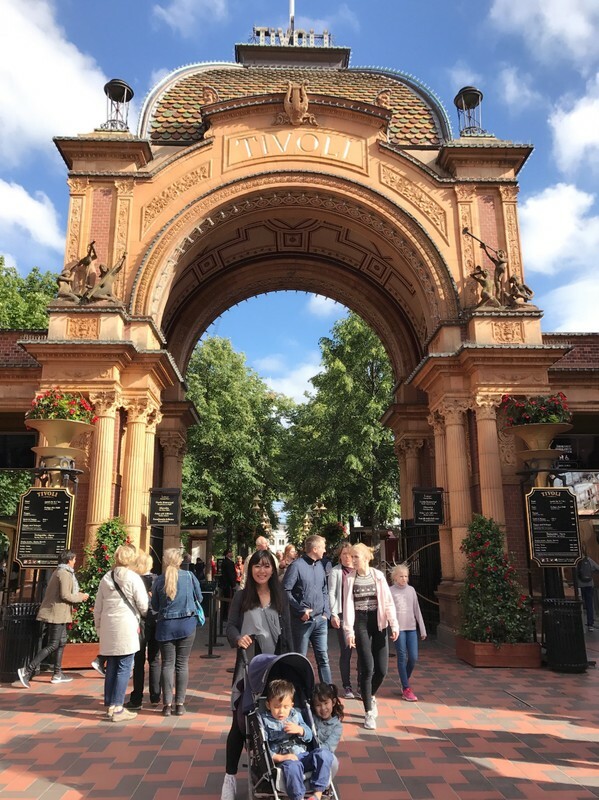 The Tivoli Gardens was probably the most expensive amusement park I've ever visited, charging high prices both for admission and for the rides. 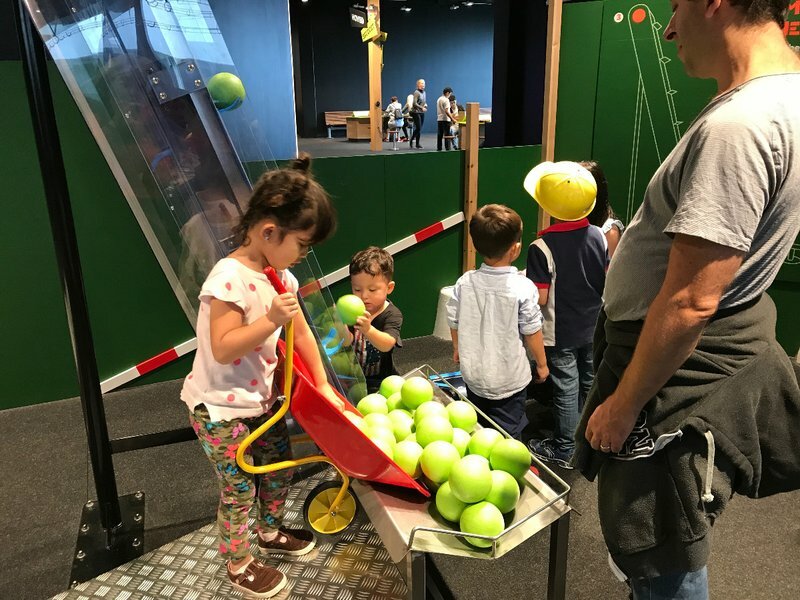 However, we rarely pass something up that we want to do solely because of the cost, and the kids deserved some entertainment after a long day of walking. 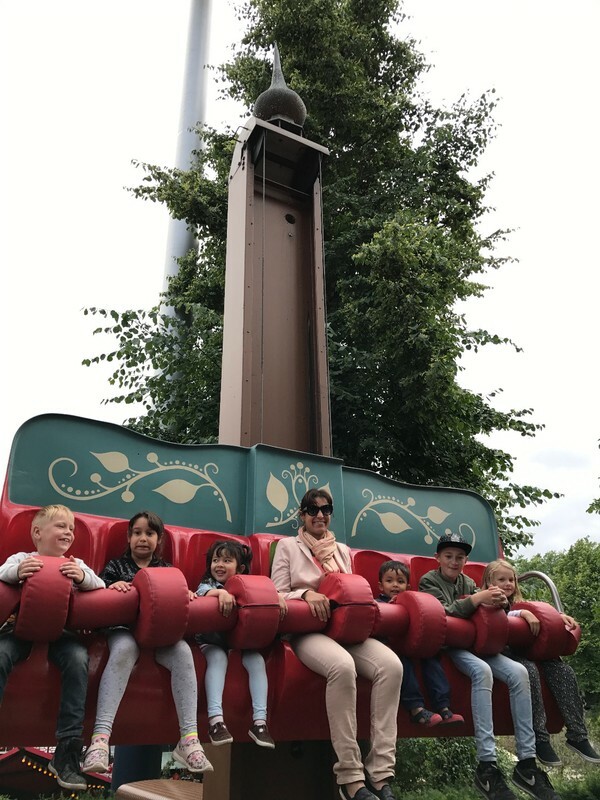 The park was beautiful in some areas, but the rides themselves were somewhat rudimentary and the place had the usual grit and smells common to amusement parks everywhere. Fortunately our kids are still young enough not to be too discriminating. They just love to be rewarded, and they know how to have fun. We decided to return to Kødbyens for dinner. My map indicated the walk wasn't every long, but we exited on the wrong side of Tivoli and it ended up being close to a half hour. 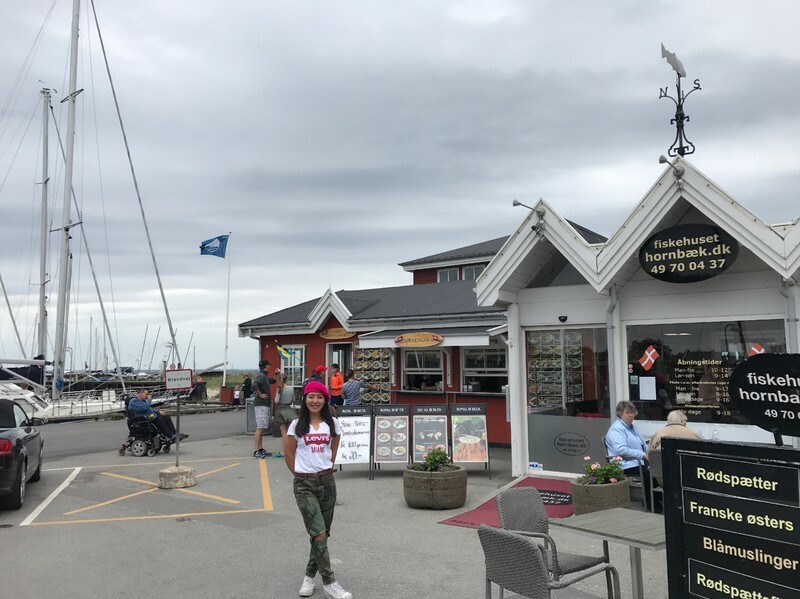 We had noticed Kødbyens Fiskebar when we were at Mad & Marked the previous day, and the proprietor of the fishmarket at Torvehallerne had recommended it to us as well. 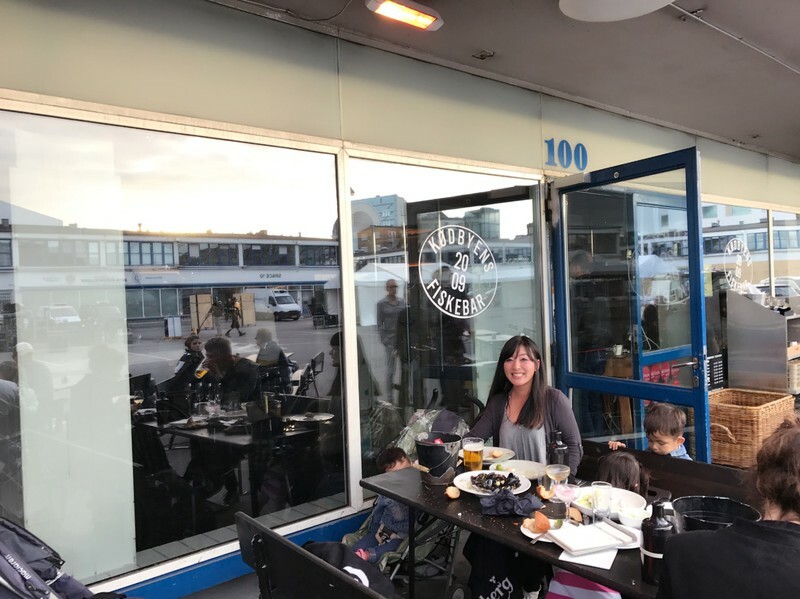 We hadn't made a reservation because we didn't want to be tied to a schedule, so we had to wait a while for a table and eventually had to sit outdoors. The sun was already going down and the chill was hardly offset by the blankets they provided to drape over ourselves. Fortunately, we had enough warm clothes and scarves to keep the kids warm without burying them in blankets. 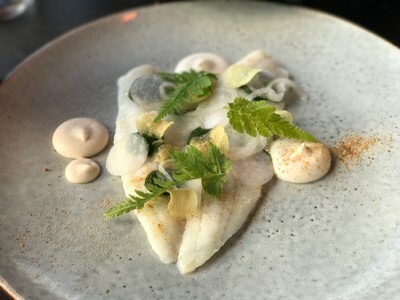 It was our first real restaurant meal in Copenhagen and our gamble paid off. 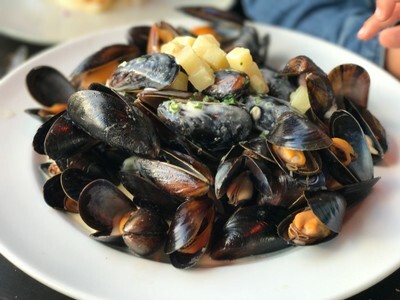 The tapas style restaurant lived up to its reputation with delicious and beautiful presentations of fish and shellfish, as well as amazing cocktails. 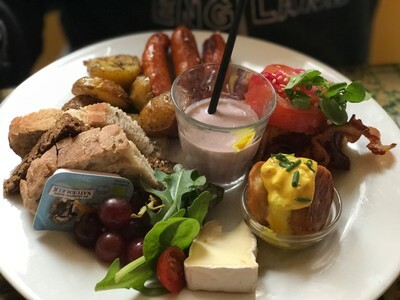 Monday morning we had one last satisfying Copenhagen breakfast before heading back across the Øresund to Sweden. Over the last few years, we've been rapidly knocking the remaining major European cities off our list of unknowns. The are still a few left in the East: most notably Warsaw, the great Russian cities, and Belgrade. In the West the only one that neither Mei Ling nor I had ever visited was Copenhagen. 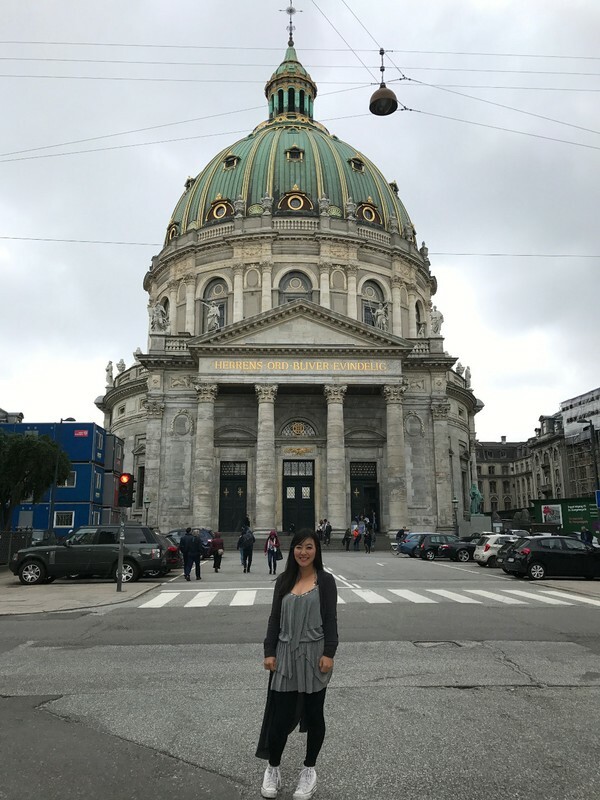 I originally planned Copenhagen as a simple stopover on the way between China and the United States, but when I realized we could spend more time on the trip I devised a three week road trip that would incorporate Gothenburg and southern Norway along with Denmark. I originally planned to include Stockholm with a more limited stay in Norway, but I reconsidered after more research into Norway's southwestern coast. 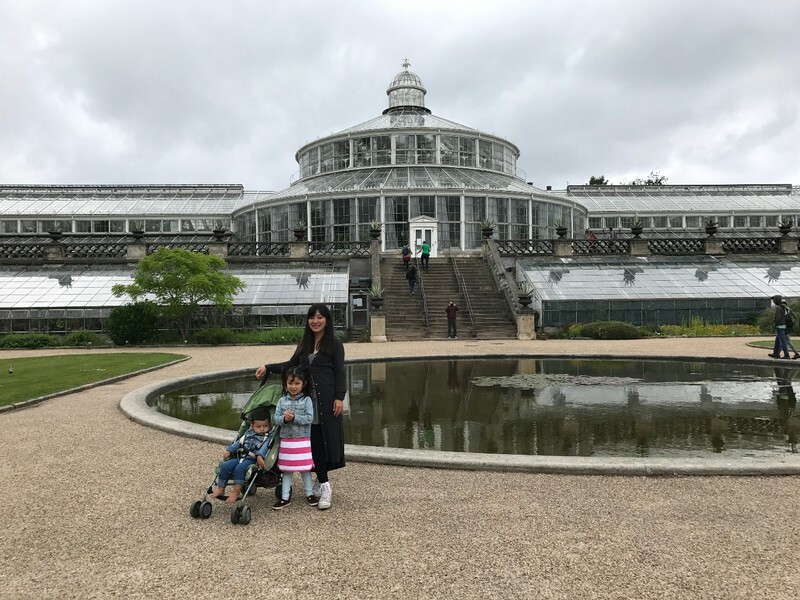 I've been to Stockholm before and while it's pleasant enough, I knew Mei Ling wouldn't find it as awesome as the central European metropolises. The western fjords would provide some adventure and natural beauty, and also would be more compatible with my plan to see all of Europe in road trips by breaking it down into digestible pieces. If we didn't go to Norway's west coast on this trip, we probably never would. Stockholm could be incorporated into a Baltic Sea trip in the future. We didn't have a rental car waiting for us at the airport. Auto rental costs are extremely high in Denmark due to taxes so I'd made our reservation across the Øresund in Malmö, Sweden for the next day. 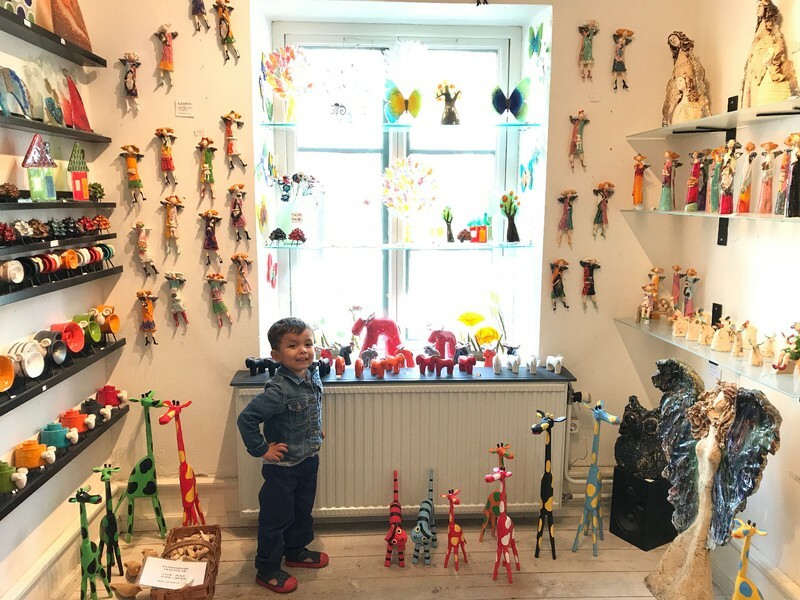 Instead we took a taxi to our Airbnb in central Copenhagen, which was on the third floor of an elegant townhouse a block away from the Torvehallerne market. The apartment had a classic style reminiscent of our lodgings in Vienna and Budapest. Our three-leg journey from Shenyang had left us exhausted, but we knew better than to let ourselves fall into bed in the mid afternoon. Instead, we immediately made a beeline for the market. I quickly realized that my attempts to memorize some phrases in Danish had been completely pointless. The vendors would give me a confused look when I sputtered out some garbled Danish and then respond in faintly accented, grammatically perfect English. I had an easier time being understood speaking English in Denmark than I did in the southern US. The same ended up being true in Sweden and Norway as well. My Scandinavian phrasebook ended up at the bottom of the suitcase for the entire road trip. 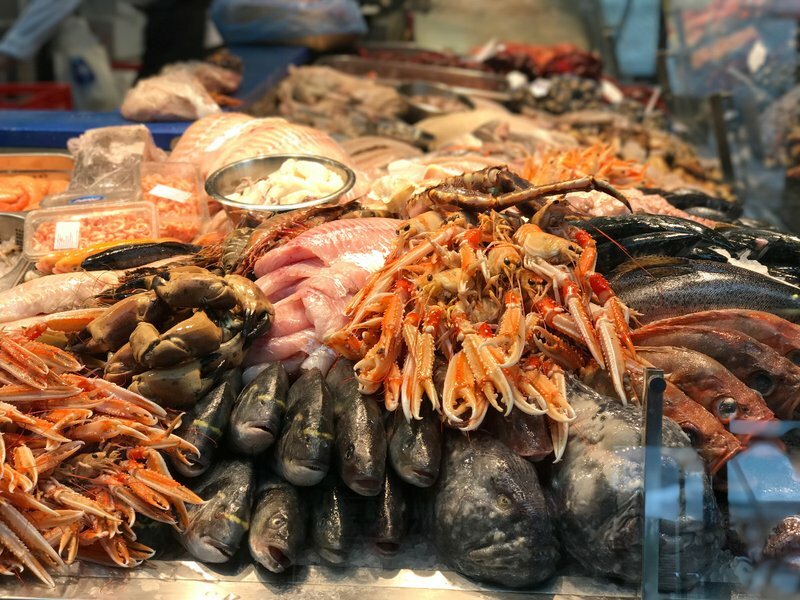 The market was superb, although we had to close our eyes to the prices which were multiples higher than what we had being paying for food in Shenyang. 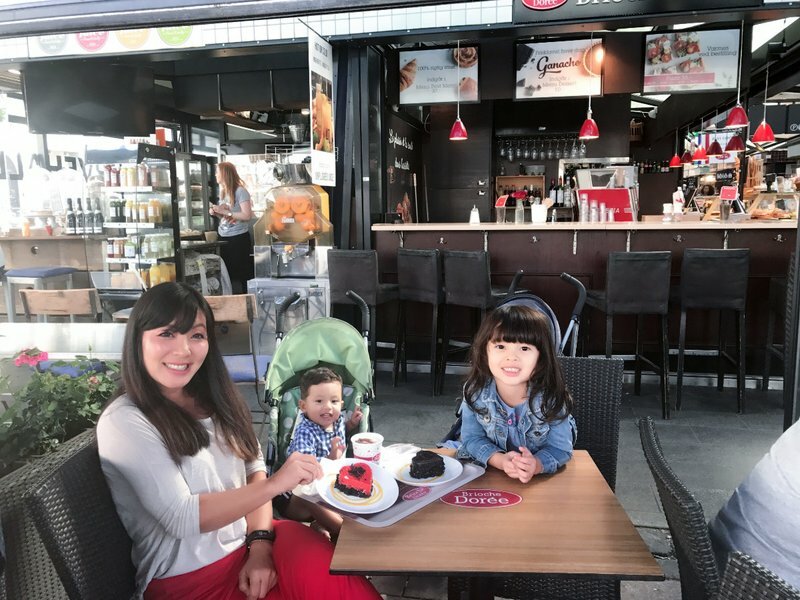 We put together an early dinner from various kiosks and topped it off with some luscious cakes, much to the delight of the kids. 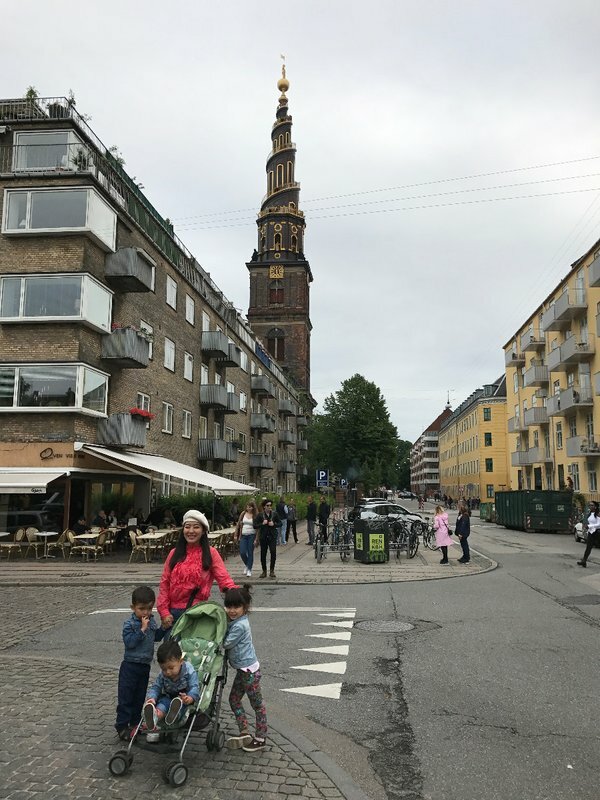 We spent another hour in the largely pedestrianized area around the Kultorvet, enjoying the energetic vibe of the cafe-lined square and taking in the 17th century Round Tower. I also bought a SIM card at a 7-Eleven which the clerk assured me would work without roaming charges in Sweden and Norway. Once we felt that we'd stayed up long enough not to have to worry about waking in the middle of the night, we returned to the Airbnb and crashed. We got up early the next morning for the mission of picking up our rental car. 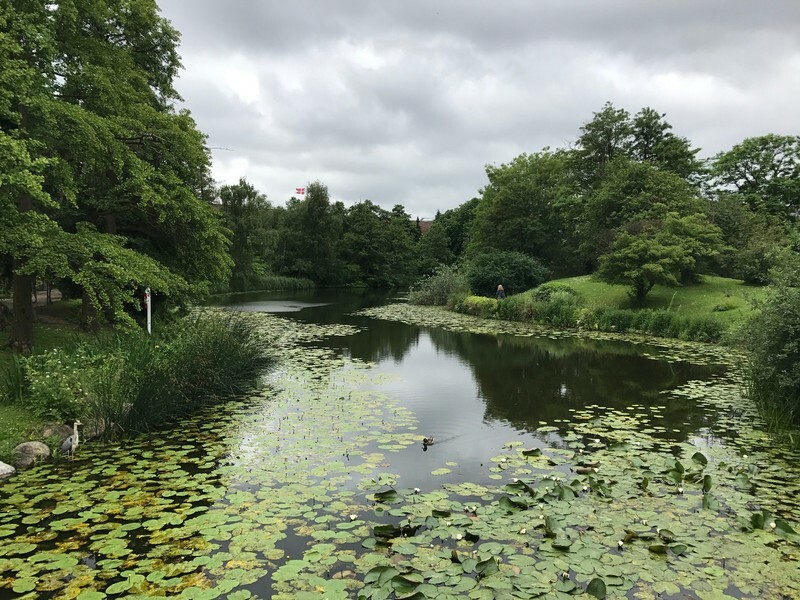 On the way to breakfast we cut through Ørsteds Park, a lush trapezoid of greenery with a beautiful central lake. South of the park was a quiet neighborhood with narrow streets and colorful row houses. 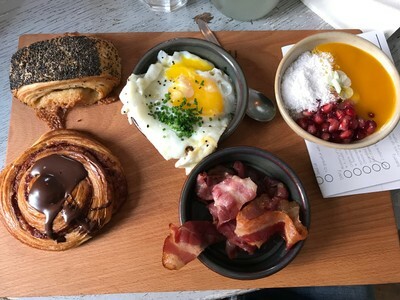 I had a long list of places in Copenhagen to eat breakfast, which seemed to be quite an important meal. Once we arrived at Next Door Cafe we found it was quite busy although they had one table left that was just our size. 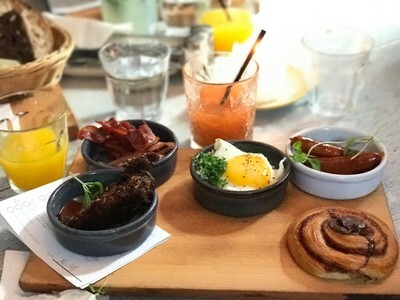 We put together a very satisfying breakfast of sandwiches, salads, and pancakes. The proprietor was very friendly although somewhat eccentrically coutured. We had some difficulty figuring out how to get to Malmö as Google Maps was recommending a bus that didn't seem to exist. In the end we took the metro to the central train station where we could buy tickets for the train that crossed the Øresund. It was a stressful process given that we had the three kids and we were using one stroller to transport the three car seats. 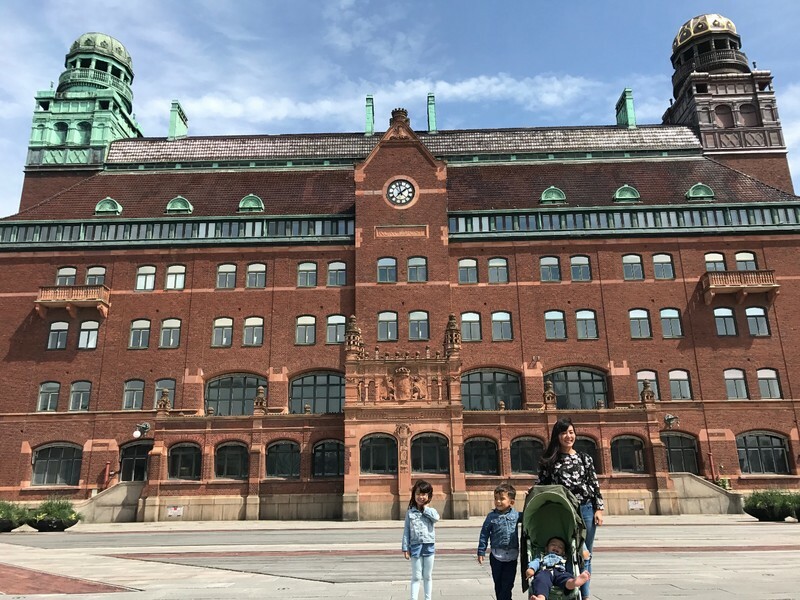 Eventually we made it to Malmö's central station, which was thankfully within easy walking distance of the auto rental agency. The pick-up proceeded uneventfully, although at the typical glacial pace I'm used to in Europe. 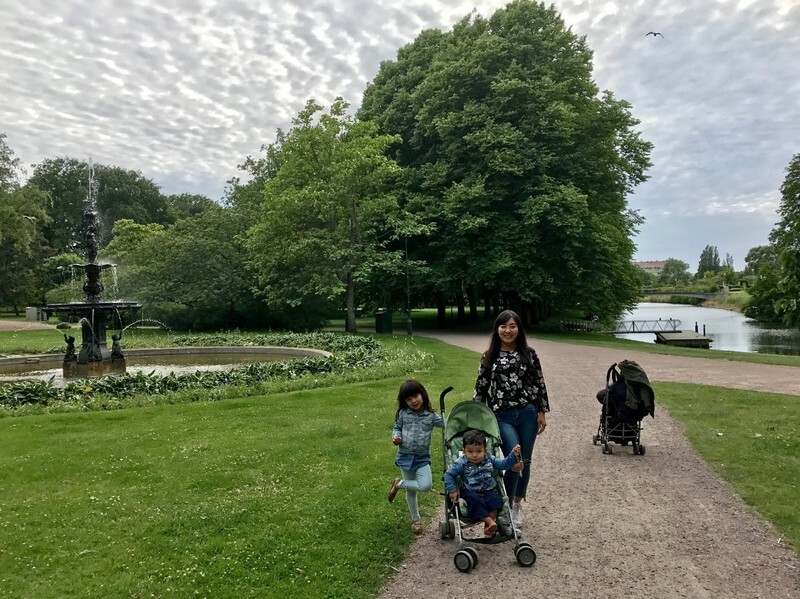 We stowed the car in a lot and walked to the town center, where we spent a few pleasant hours that I'll describe in my Copenhagen day trips post. 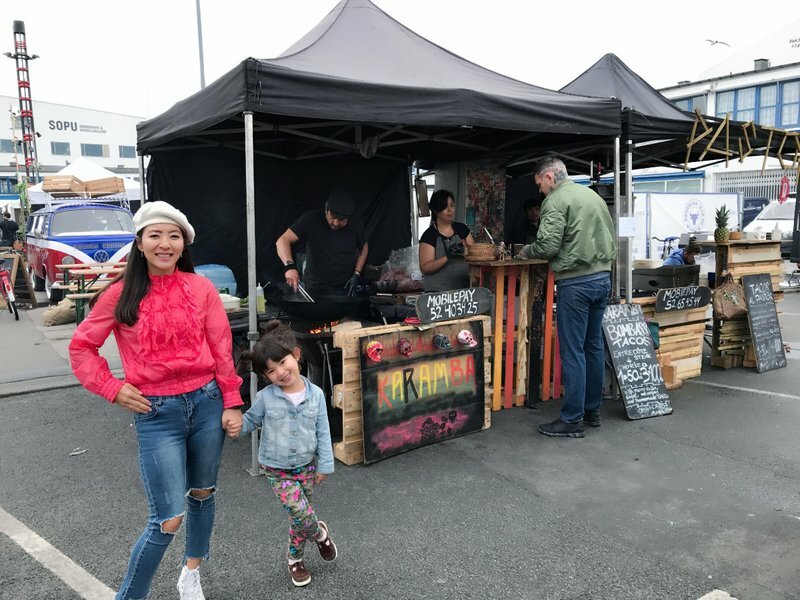 We returned to Copenhagen in the early evening and drove straight to Papirøen (Paper Island) which housed the city's largest food court Copenhagen Street Food. Paper Island is one of several artificial islands that comprise the Christianshavn section of central Copenhagen. I was surprised to learn that this very modern-seeming layout was devised more than three hundred years ago. Paper Island got its name from warehouses that stored countless rolls of newsprint for the Danish press industry. 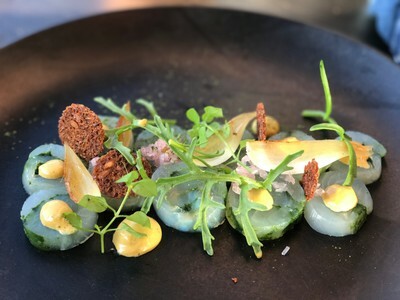 Once the island outlived this function, the warehouses were abandoned until 2014 when restaurateur Jesper Møller took over the largest warehouse and most of the island for his international food hall concept. Outside of the warehouse, the island is so quiet that it's hard to believe that anything of note is taking place nearby. As soon as we walked through the doors, however, we saw a beehive of busy food kiosks and at least a couple hundred patrons. In the back was a lively patio with views across Copenhagen Harbor to the Skuespilhuset theater. 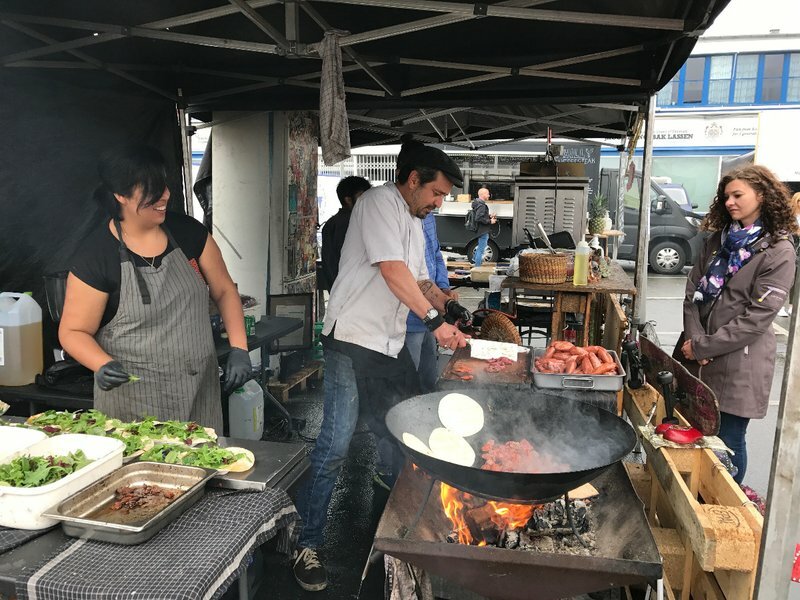 The food selection was impressive with offerings from the Middle East, the Far East, and Latin America as well as Europe. 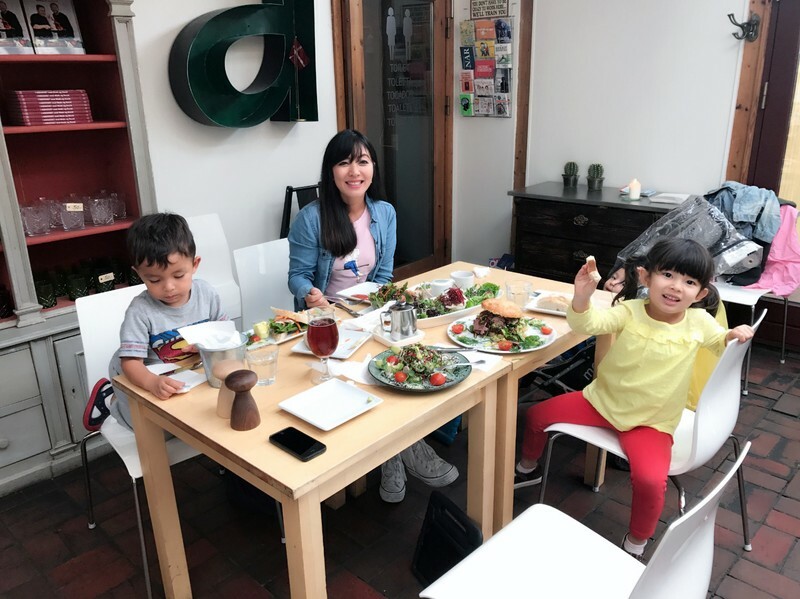 We put together a meal that was delicious and fun to eat, although managing the three little ones at a crowded shared table was a little stressful. 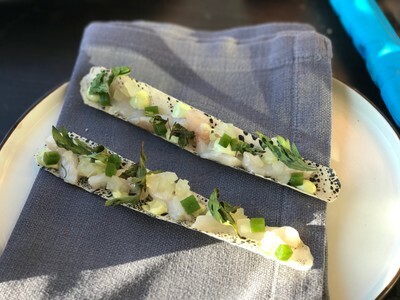 I've since learned that Copenhagen Street Food closed at the end of 2017 to make way for residential development of Paper Island, but it seems it will be opening at a new location in May 2018. 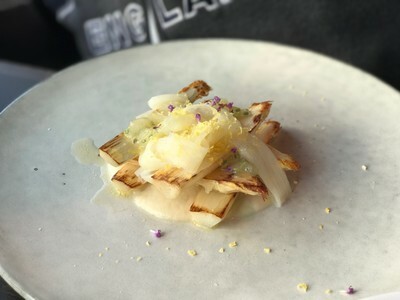 I'm glad we all had the chance to see and document this unique gastronomic experience before it disappeared into memory. 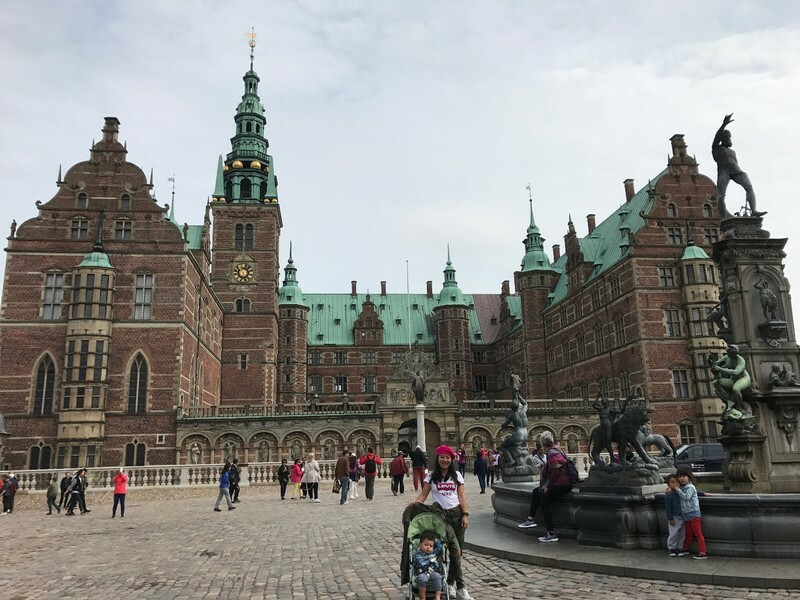 We spent all day Thursday visiting castles in the northern part of Zealand, the large island on which Copenhagen is situated. 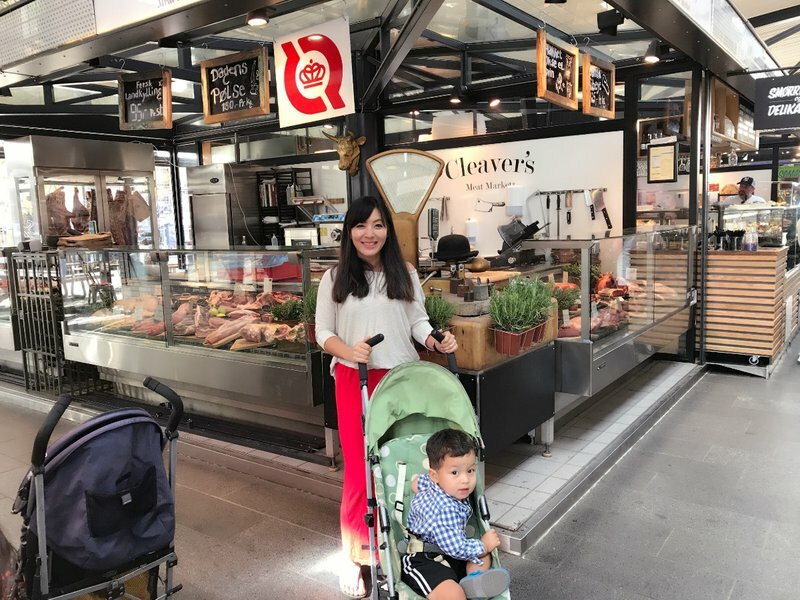 In the evening we visited another Copenhagen food court called WestMarket, which was unsurprisingly located in the large neighborhood called Vesterbro just to the west of the city center. There were several good kiosks but the place didn't have the same high energy level or beautiful setting as Copenhagen Street Food. 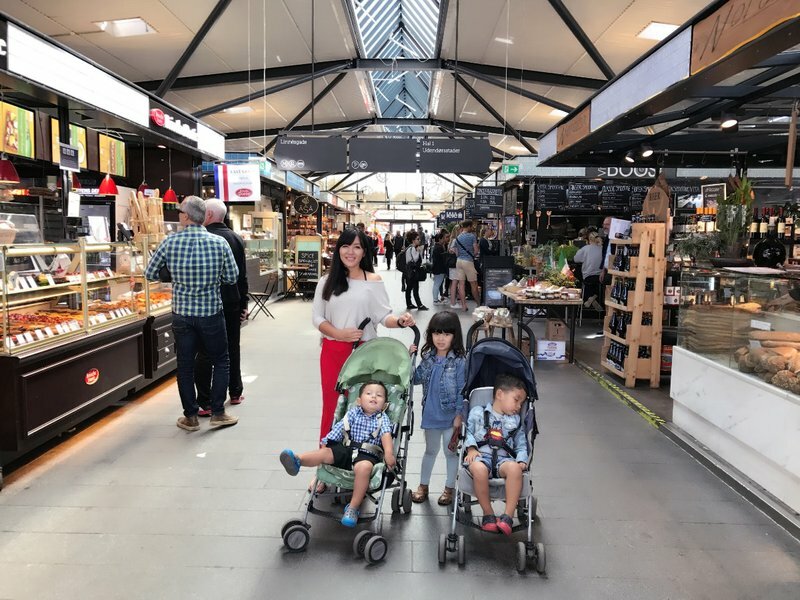 I'm not really sure why, but instead of making a walkthrough video of the food hall we made a video of me playing tag with my kids plus a Danish kid who joined in. See if you can spot which kid is the Danish one. On Friday we drove to Roskilde and the little island of Mon in the south, which I'll detail in my day trips post. 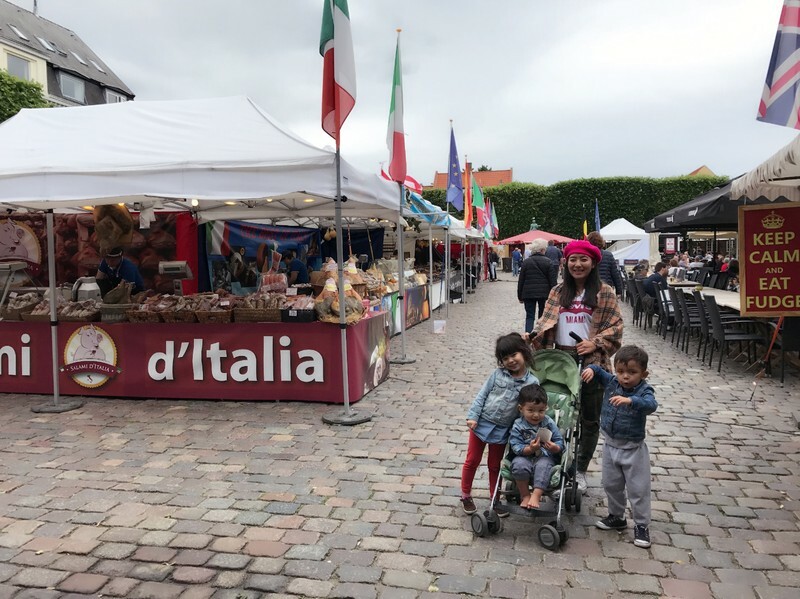 In the evening, we went back to Copenhagen Street Food to try all the kiosks our stomachs didn't have room for the first time. It was much more crowded than it had been on Wednesday and the kids were falling asleep on the benches while we tried to shovel food into their mouths. We probably should have made an advance reservation in the central seating area. Somehow we managed to eat our fill while standing next to the tables our kids were slumped over. 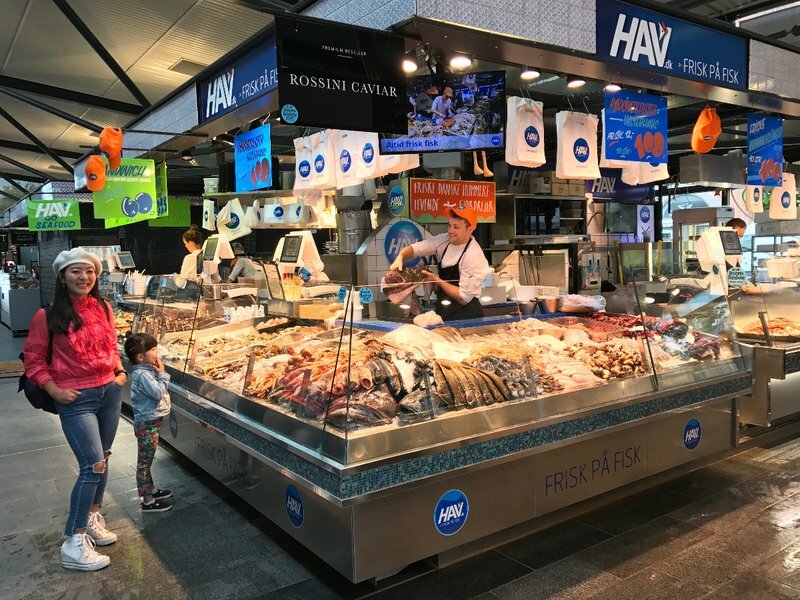 Saturday we had an early breakfast at Torvehallerne and got to see the seafood market in its morning glory. 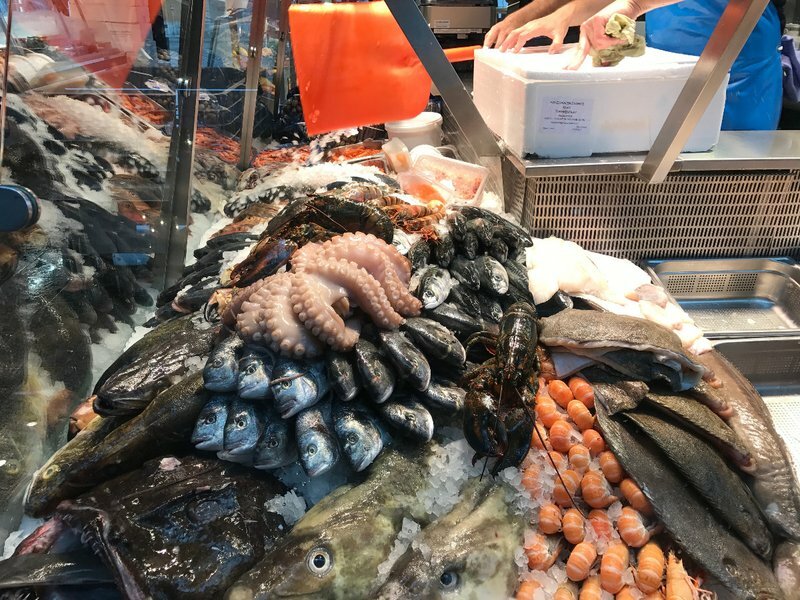 There were beautiful examples of some of our favorites such as monkfish and turbot as well as some fish that were completely unfamiliar. One very unusual looking large fish was the wolf fish, which we would ultimately enjoy several times on the trip. 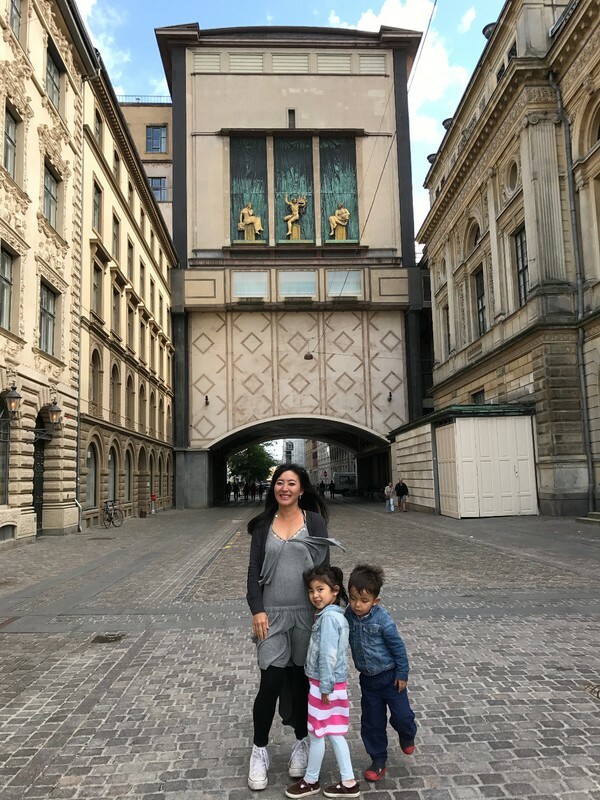 We'd already been staying in Copenhagen four days and hadn't seen much of the city besides breakfast cafes and food courts. Now that we'd completed all our planned day trips, it was time to begin our exploration of the city itself. 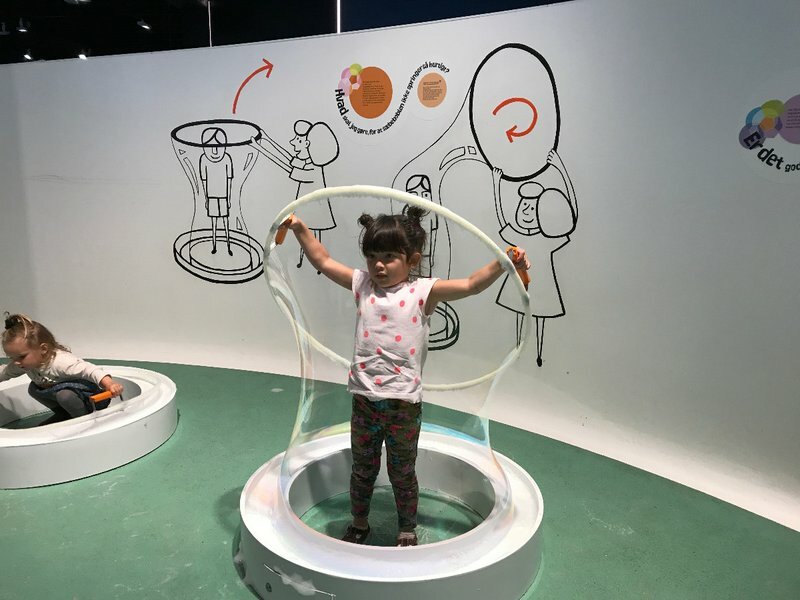 It was a rainy Saturday morning, so we decided to start the day at the Experimentarium, a science museum designed for kids that had just been renovated and expanded earlier that year. The first thing that one notices when entering is the enormous double helix copper staircase that begins in the lobby. The kids scampered up to the second floor where there was a seemingly endless selection of interactive displays. All three of them ran in separate directions so I tried to stick with Ian and prayed Mei Ling would be able to keep track of Spenser. It was virtually impossible to get Ian to leave a huge construct of wire tunnels transporting balls from one side to the other to simulate international shipping. By the time we made it to the second floor which had crafts and countless additional displays we were already starting to get hungry. I believe there was a third floor as well which we never made it to. 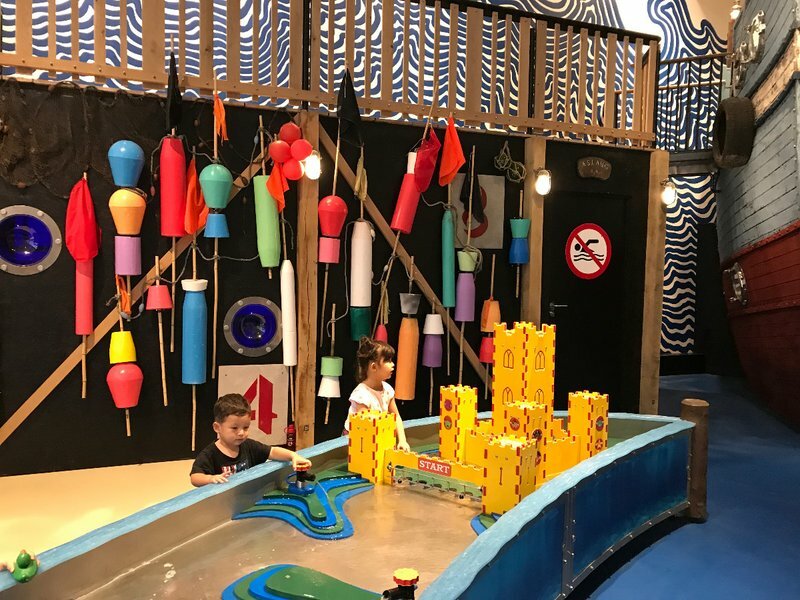 It was by far the best kids' museum I'd ever seen. 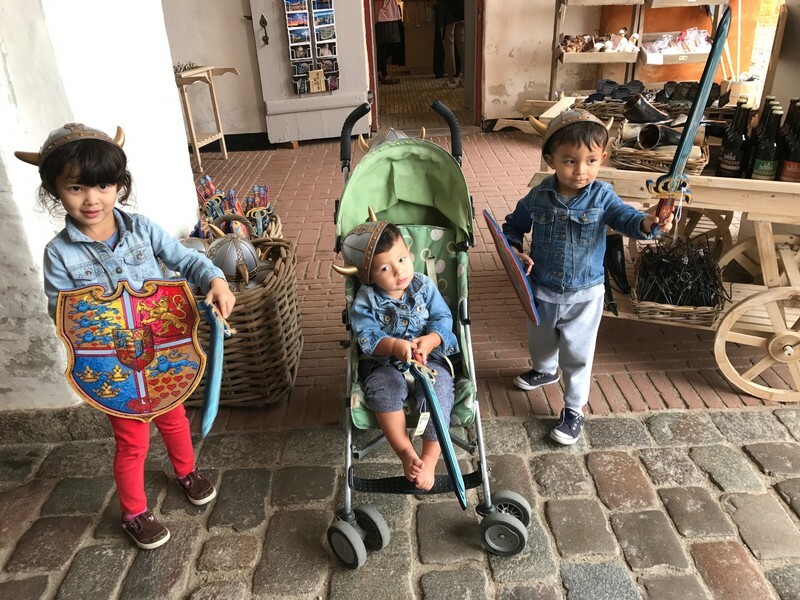 I'd recommend budgeting at least four hours for a visit, although even then it would take several visits for a kid to get everything out of the museum. 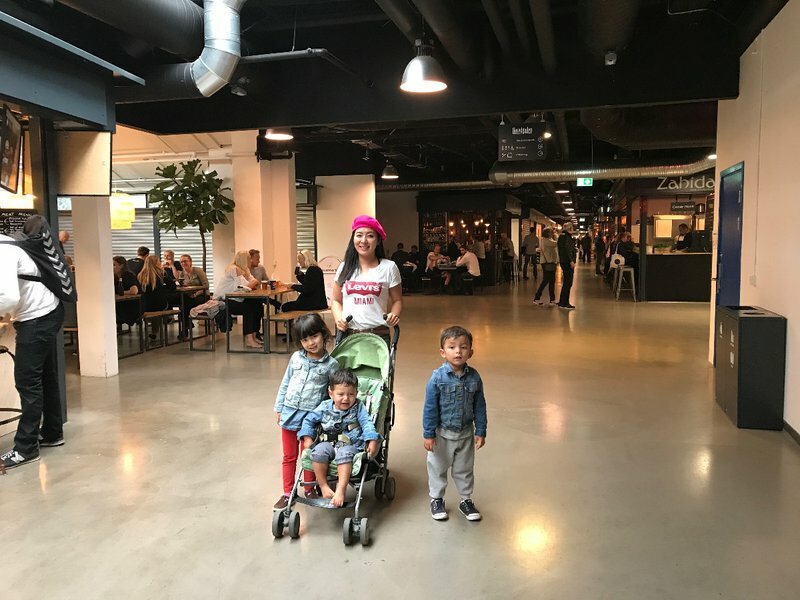 By the time we finally were able to extract the kids from the Experimentarium we were starving so we drove to the last of the four Copenhagen food courts on my list, Kødbyens Mad & Marked. 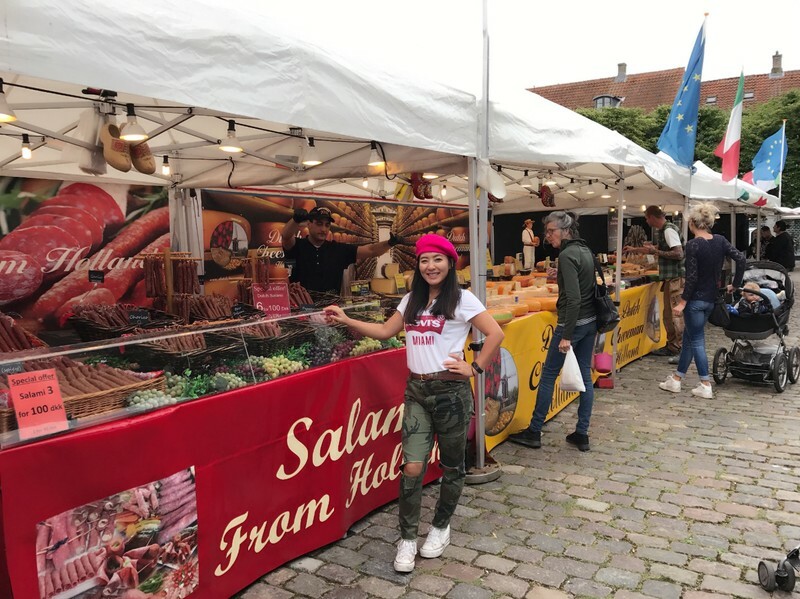 This two-year old market in the former meatpacking district of Kødbyens is best known for meats and other grilled foods but there was still plenty of variety. It's an outdoor market and only open on weekends between April and October, when the weather is just mildly chilly and rainy. 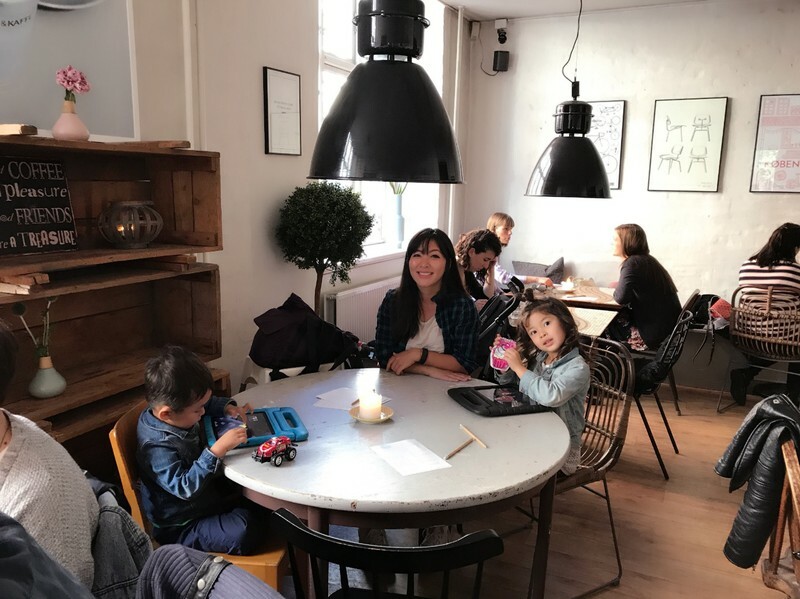 We spent about an hour there enjoying several dishes, enjoying the Bohemian atmosphere, and playing a semblance of bocce with the kids. 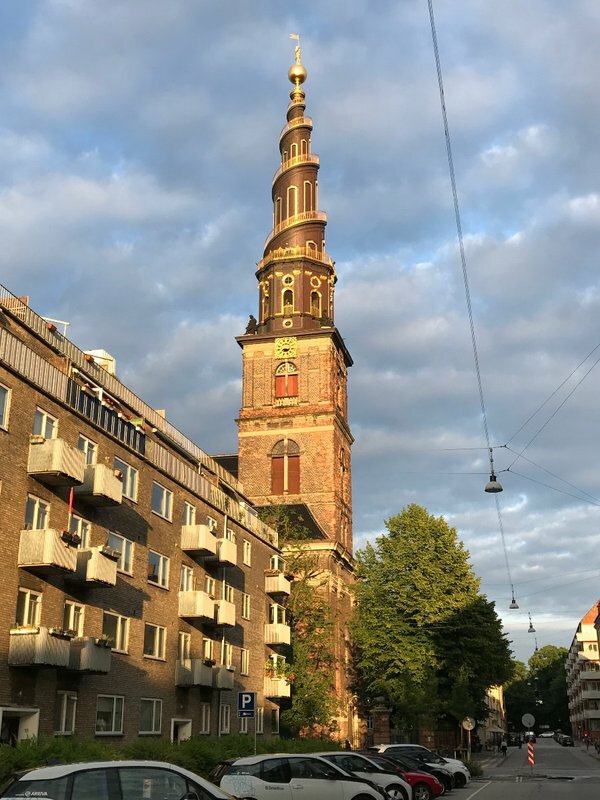 One Copenhagen landmark that seems to be visible from almost anywhere in the city is Vor Frelsers Kirke (Our Savior's Church) in Christianshavn. The 17th century Baroque church is famous for the golden staircase that winds around the outside of the elegant dark brown spire. When I saw that the people were climbing the stairs all the way to the top of the spire, I knew I had to have that experience for myself. Both Cleo and Ian demanded to join me, so with some trepidation we headed into the church while Mei Ling and Spenser waited for us below. After a short wait on line, the three of us began our ascent. The first part was a few deceptively simple flights of modern stairs, but soon we found ourselves climbing very steep wooden steps that were more like ladders than staircases. It was a relief once we exited the inside of the spire and found ourselves on the shallower steps of the winding outside staircase. I was still rattled from the ladder stage and the view of houses and people far below us wasn't soothing my nerves. 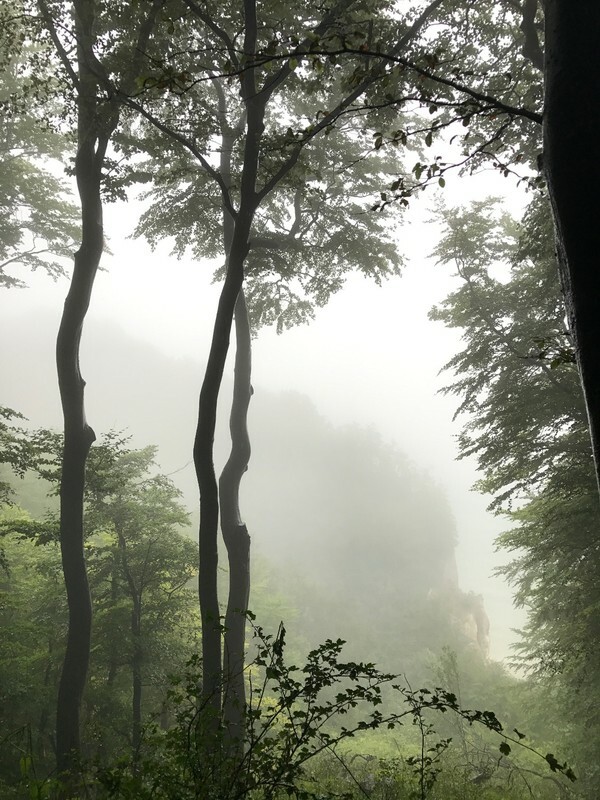 The vertiginous climb was too much for some people and every once in a while there would be a logjam as someone decided they couldn't go any further and started to reverse direction. 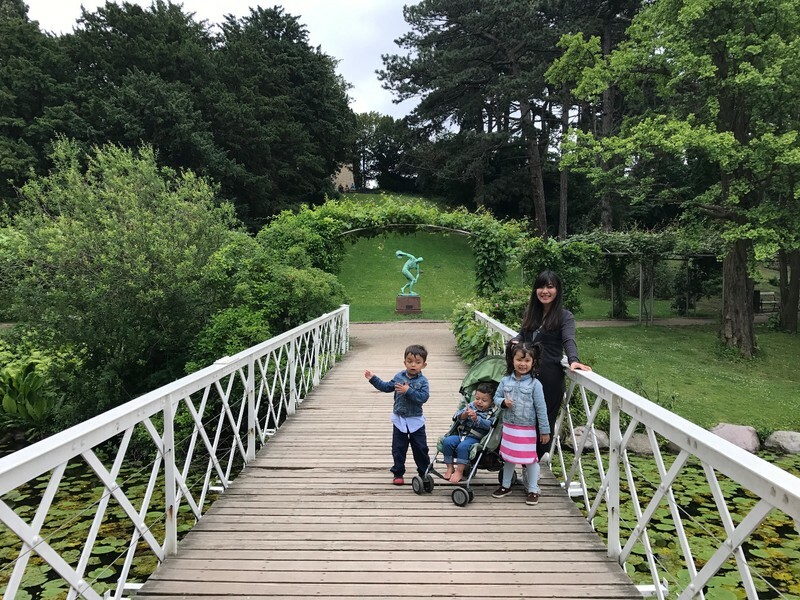 The railing was way too high for the kids to climb over but I still found myself gripping their hands as much as I could. Fortunately I had my iVUE Horizon video sunglasses on so I was able to video the climb without letting go of the kids. 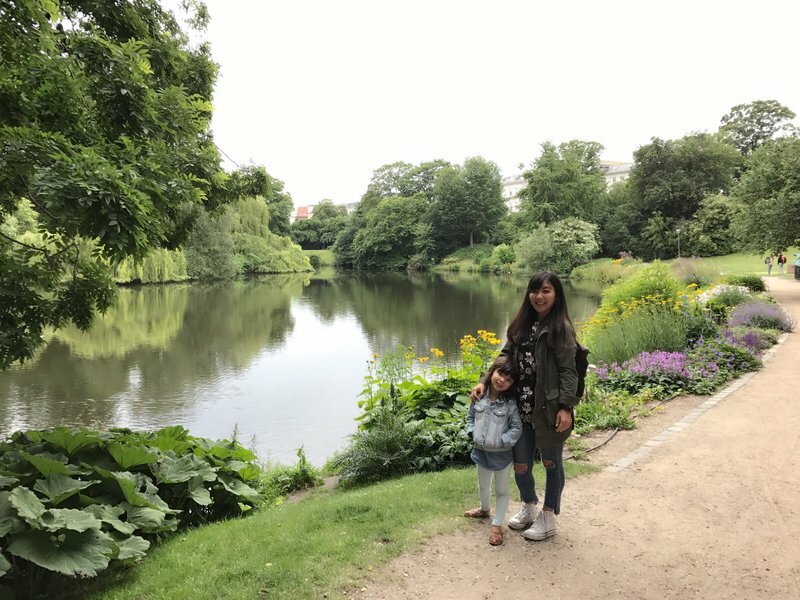 Back on solid ground, we found Mei Ling and Spenser who had just returned from a walk to the Christiania commune a block away. 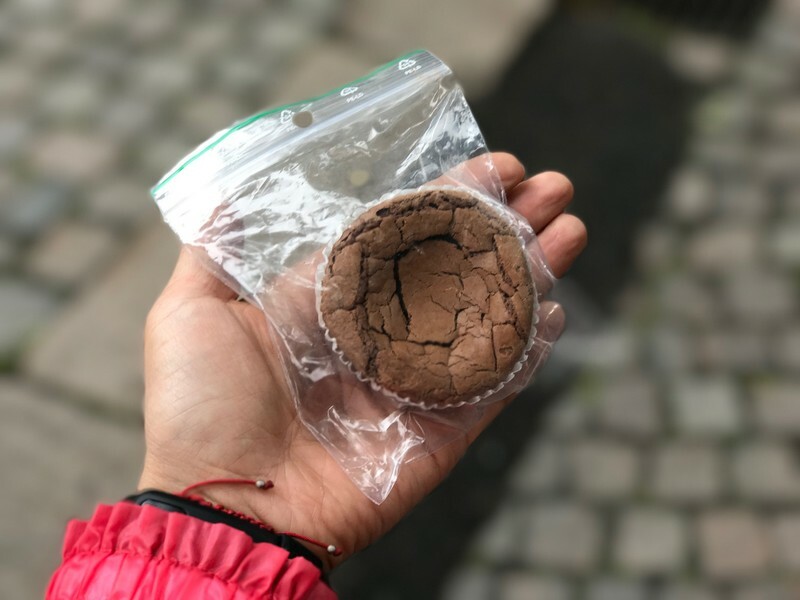 Mei Ling casually informed me that she had bought a hash brownie which completely confounded me. 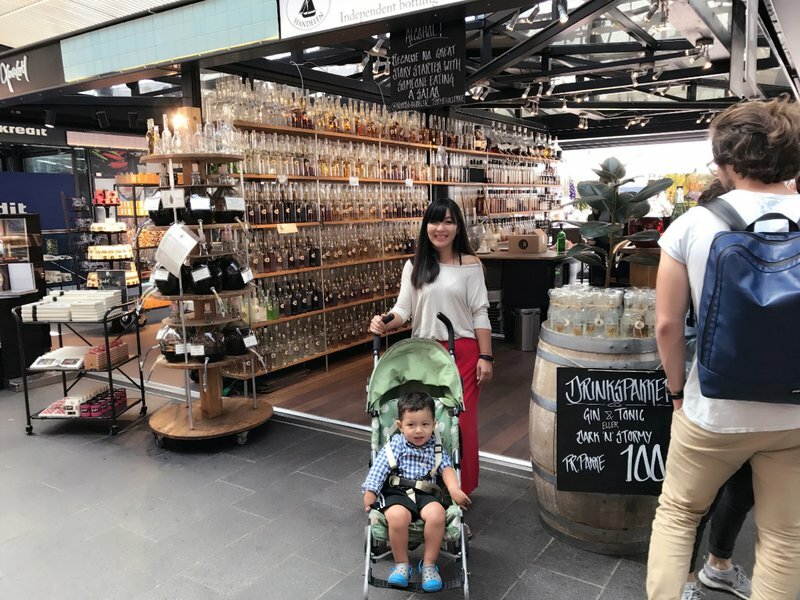 Neither of us even smokes pot at home, and I couldn't grasp what had suddenly possessed her to start experimenting with that kind of stuff in a foreign country with three kids in tow. 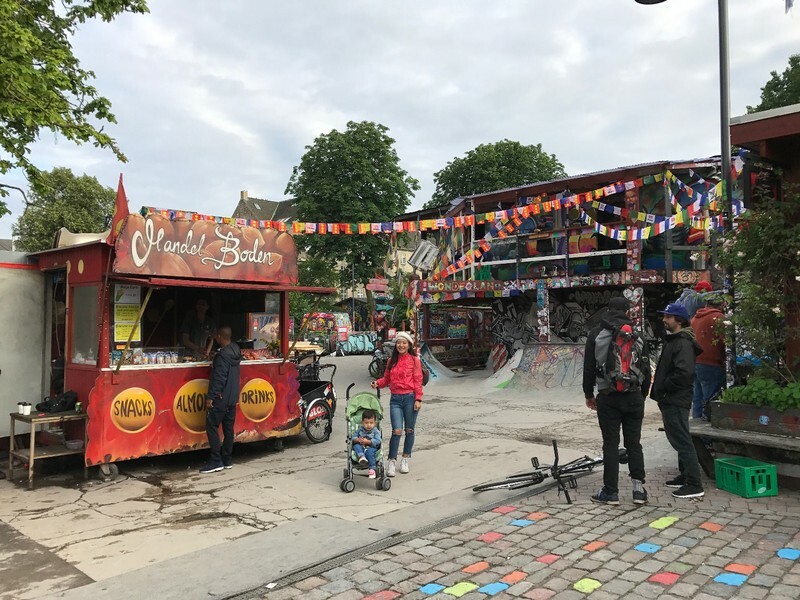 Even though marijuana is de facto legal and sold fairly openly in Christiania, you really never know as a tourist when you might be getting set up for some kind of trouble. Not only that, but I can't count how many times I've seen patients in the emergency room with various unpleasant reactions to cannabis consumables. I had visions of sitting in a Danish emergency room with my hallucinating wife and three crying kids. I guess my partying days must be done for good, because I made Mei Ling toss the brownie in the trash. 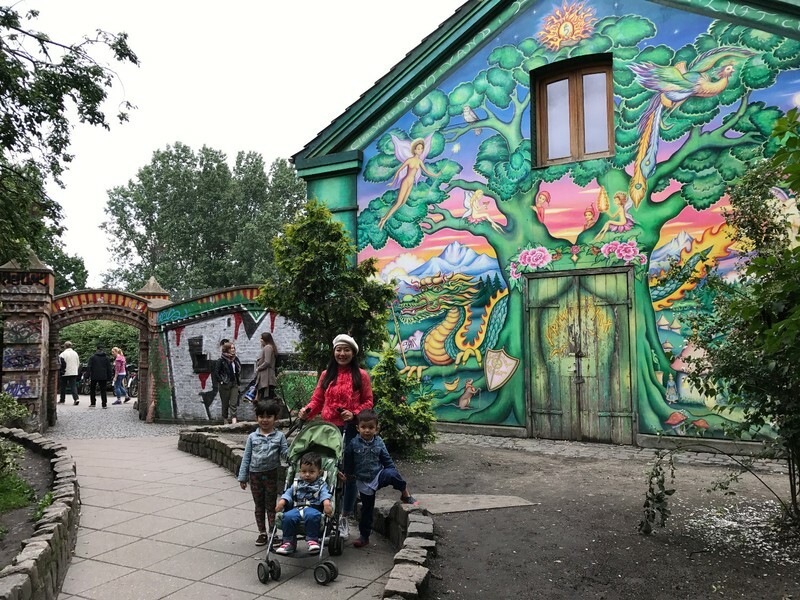 The weird brownie episode didn't put me off from wanting to see Christiania myself, so we did a quick spin around the colorful neighborhood together. The community was established almost fifty years ago by squatters in an abandoned military barracks, but the residents currently own the land through a foundation. 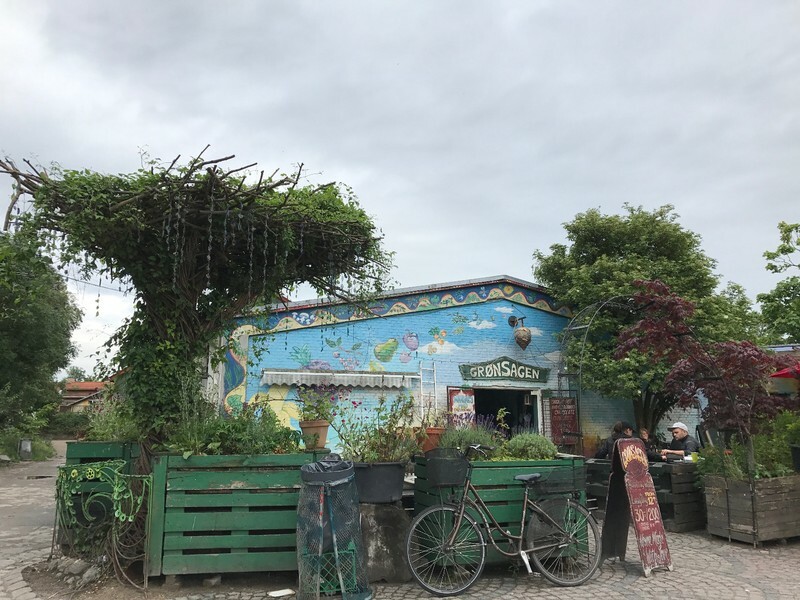 The way things work in Christiania is difficult for an outsider to understand, but the community has its own set of laws and manages its own electricity and water supply. Probably the biggest attraction for visitors is the easy availability of cannabis, which has brought a great deal of controversy with it. The cannabis itself isn't the problem so much as the money associated with it, which has attracted organized criminal gangs to affiliate themselves with some of the residents. The main street of Christiania was once known as Pusher Street, or the Green Light District. The permanent cannabis stalls that once lined the street were destroyed by the residents after the shooting of a police officer in 2016, but today there was no shortage of small stores and kiosks openly selling marijuana. Naturally, photography in this area was strongly discouraged. 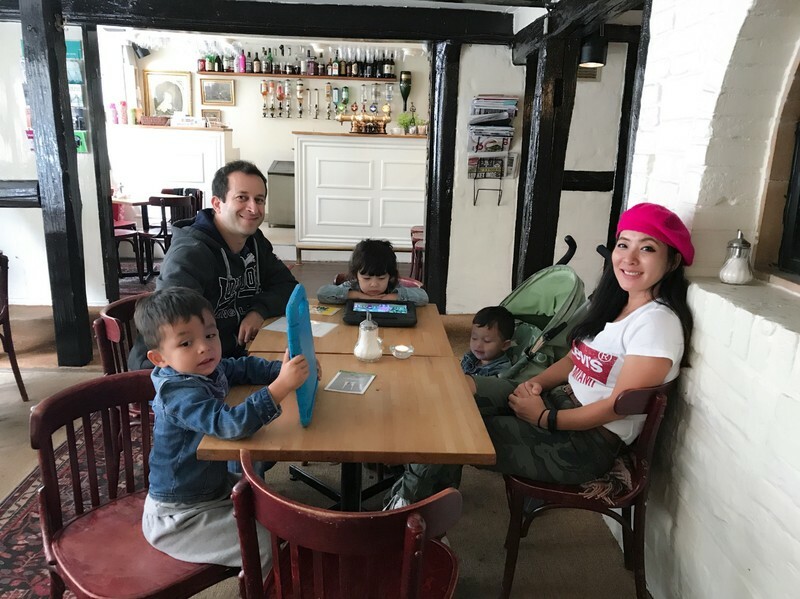 We and the kids were more focused on the beautifully painted and landscaped homes and cafes that were ubiquitous in the neighborhood. 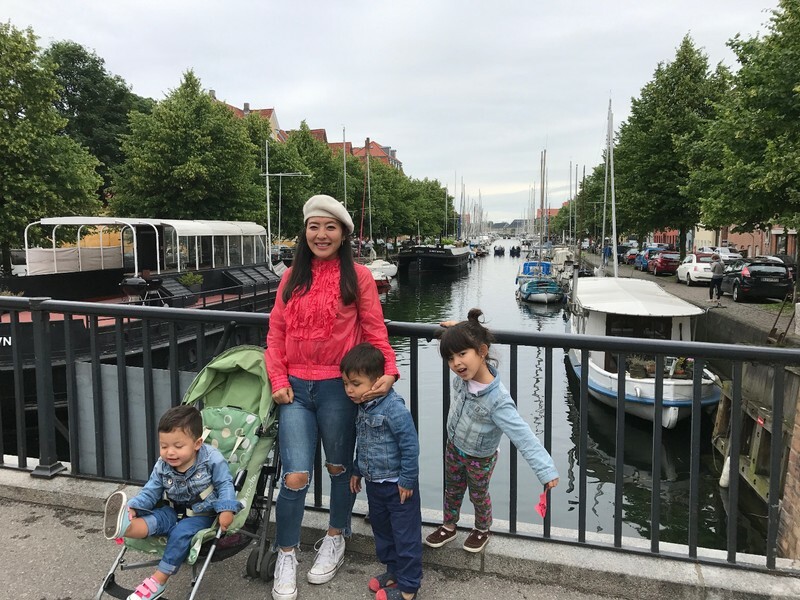 We spent a little time walking around the pretty canals and bridges of Christianshavn before getting dinner and going home. 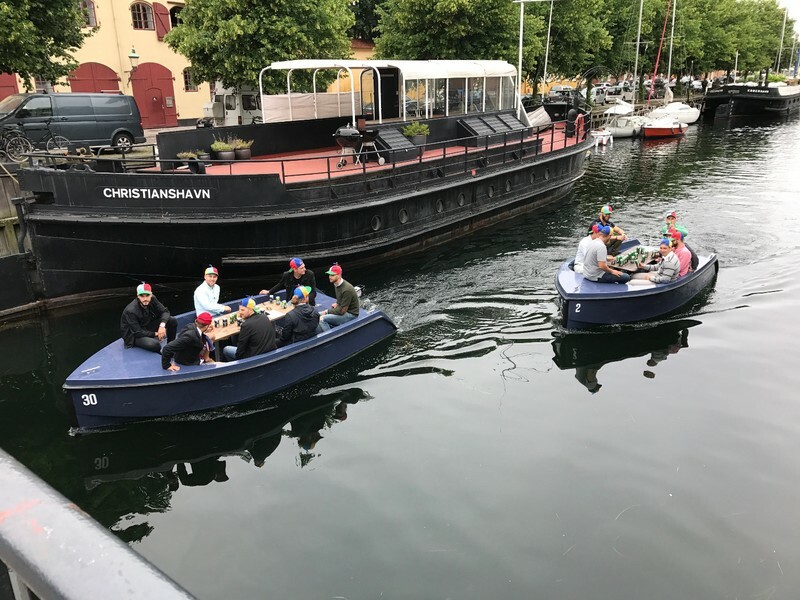 There were cafes set up on barges along Christianshavn Canal as well as drinking parties on little motorized skiffs. People in Copenhagen certainly know how to enjoy themselves.